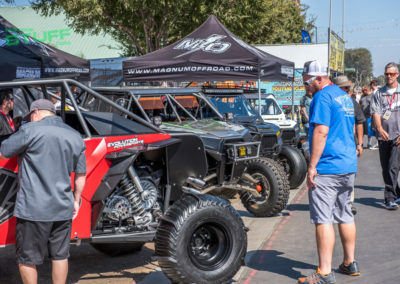 Thousands of sand sports fans and offroad enthusiasts gathered in Costa Mesa, California at the OC Fair and Event Center to kick off the sand dune season at the Sand Sports Super Show where attendees have to opportunity to check out the latest products, industry innovations and most impressive machines from the top UTV and off-road companies in the industry. 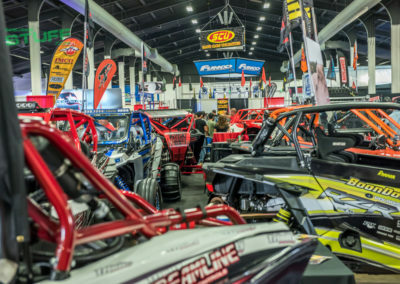 2016 is the 18th year for the annual event; the Sand Sports Super Show is the biggest and most exciting sand sports expo in the world. 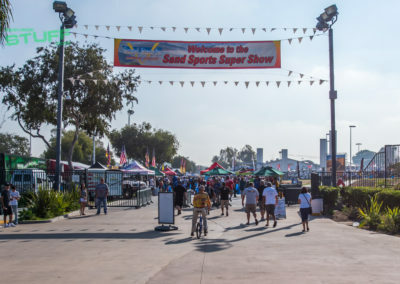 Attendees would waste no time, as it’s hard to see the entire show in one day, the fairgrounds filled up with people very quickly. 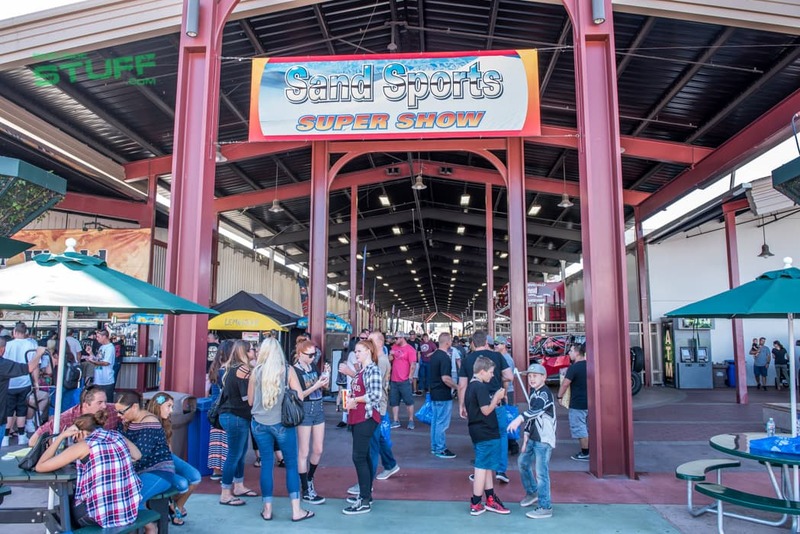 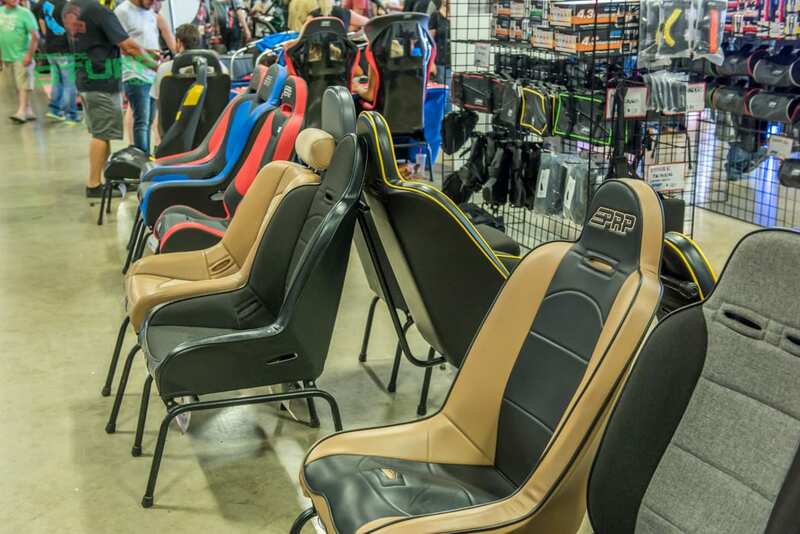 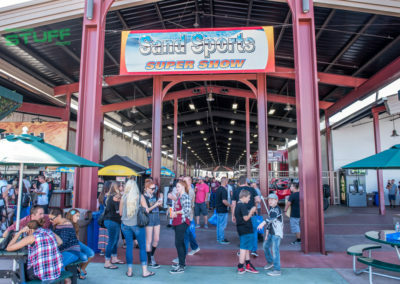 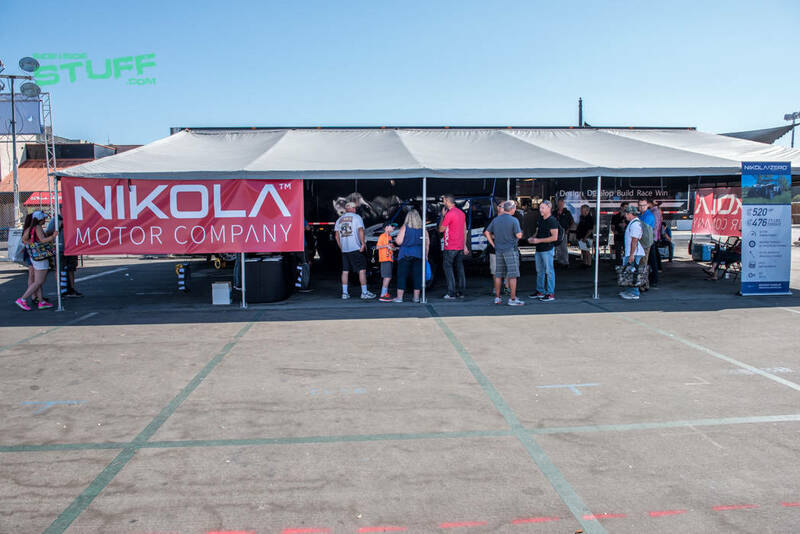 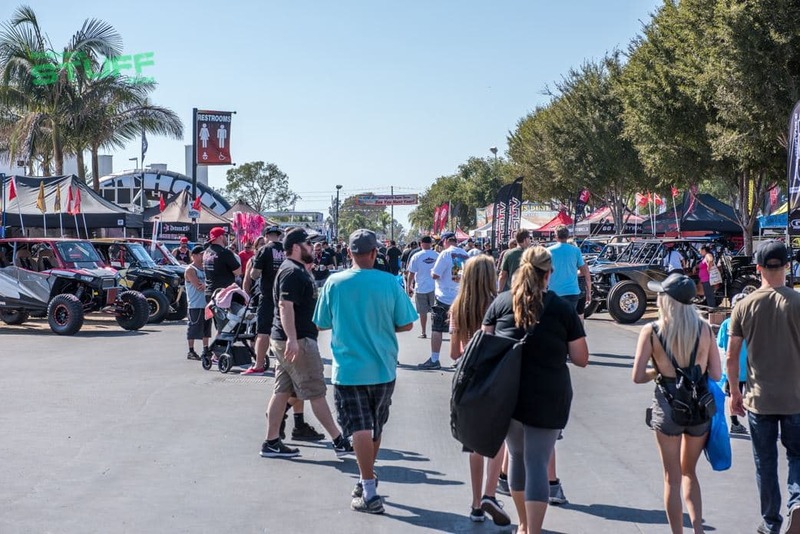 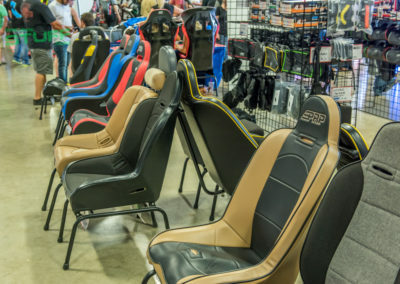 Exhibitor space completely sold out at this year’s event packing the fairgrounds with over 300 vendors showcasing everything from their latest products and custom builds to debut at the show. 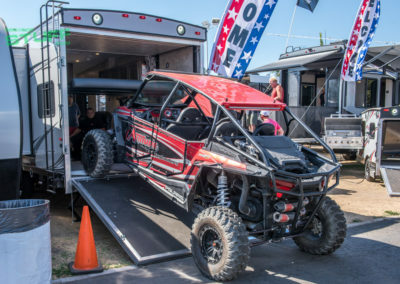 As this was our first time to the event, we weren’t sure what to expect when it came to the amount of UTV STUFF at the show. 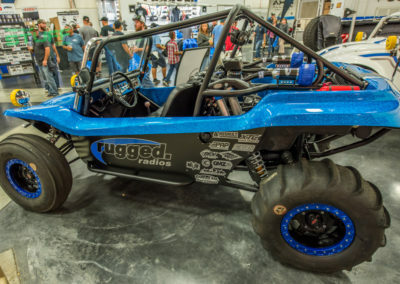 In the past, the show featured mostly dune buggies and sand rails so we made the assumption this year would be the same. 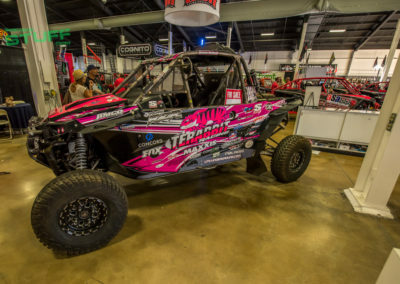 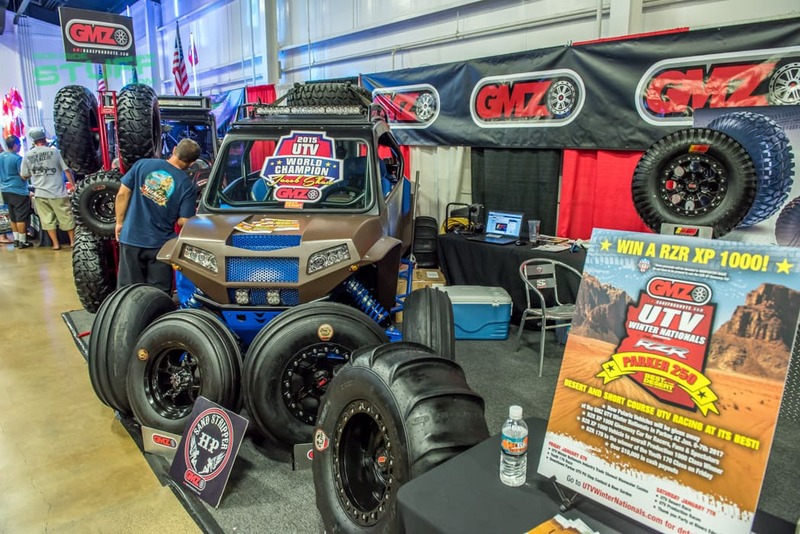 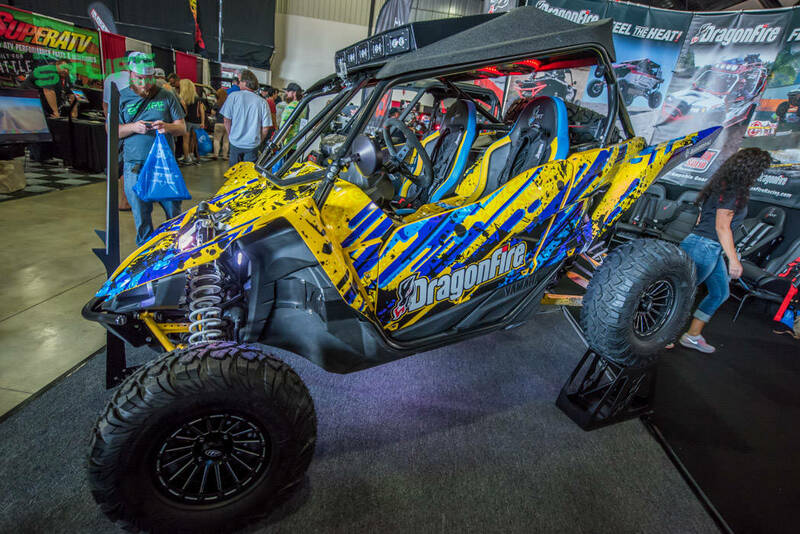 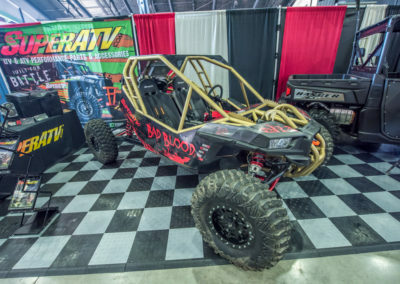 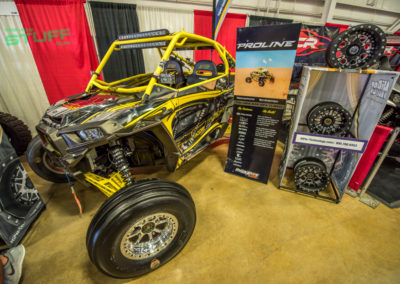 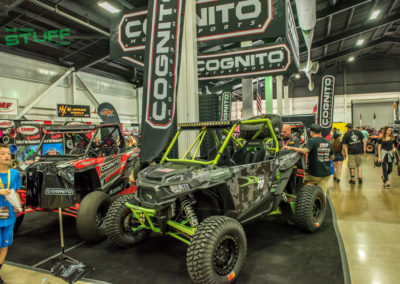 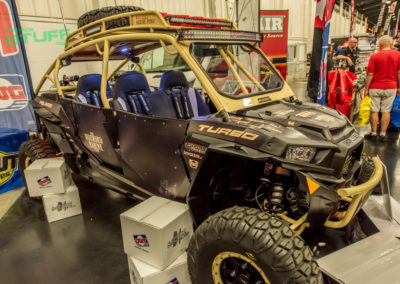 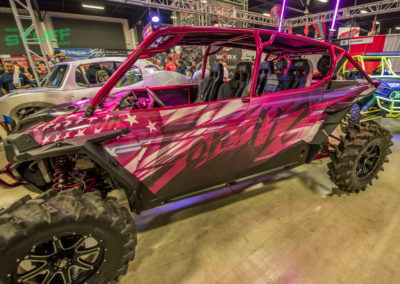 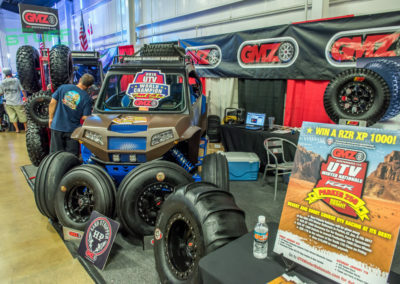 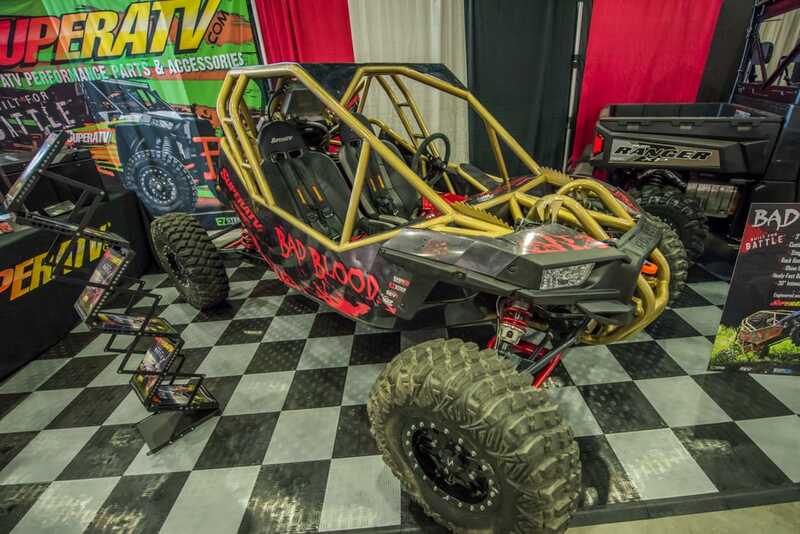 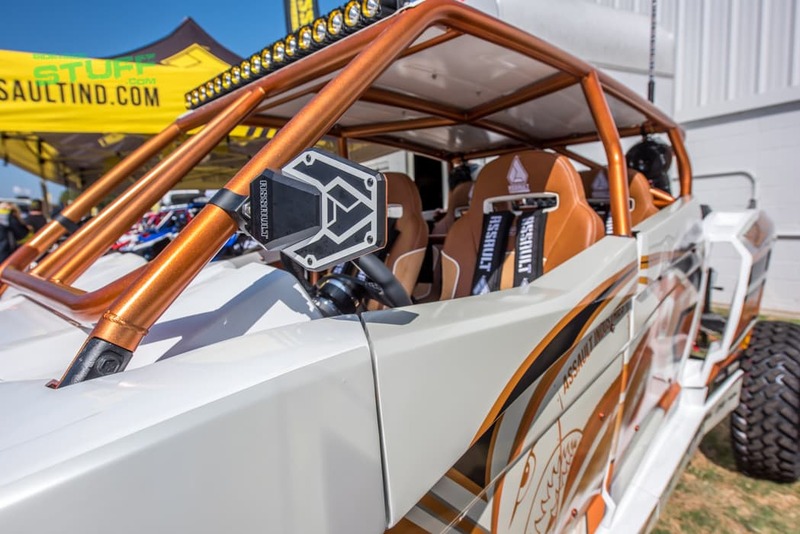 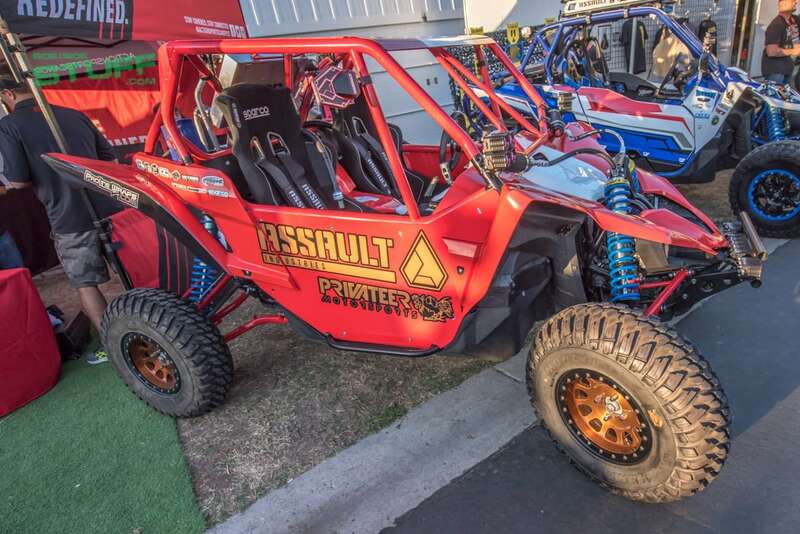 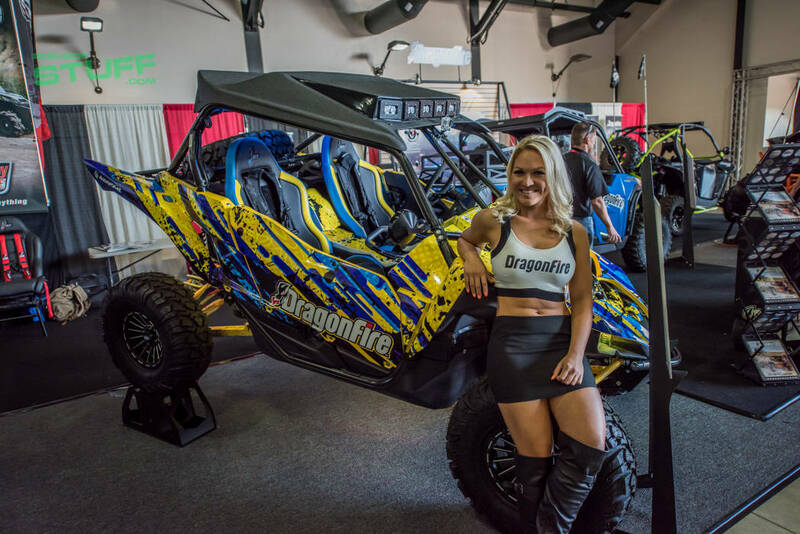 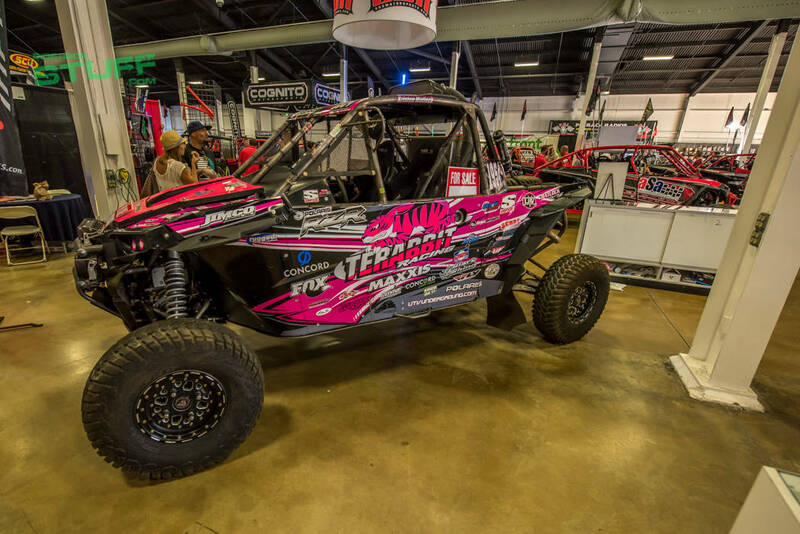 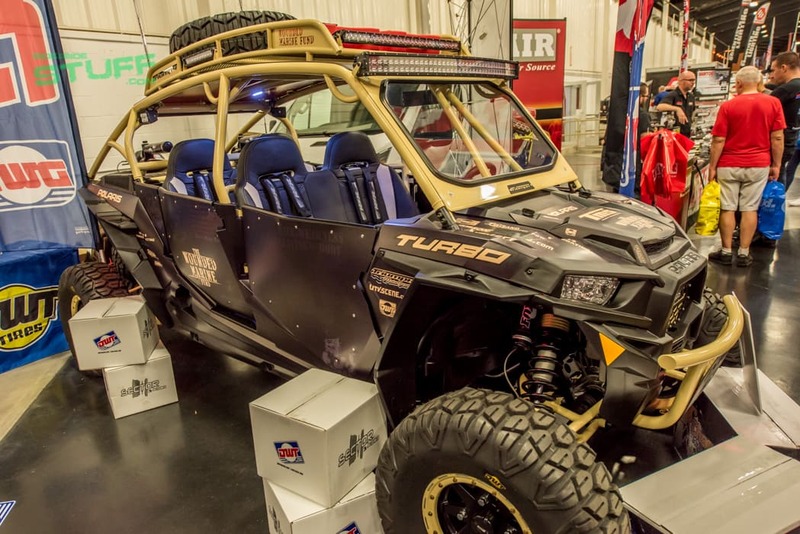 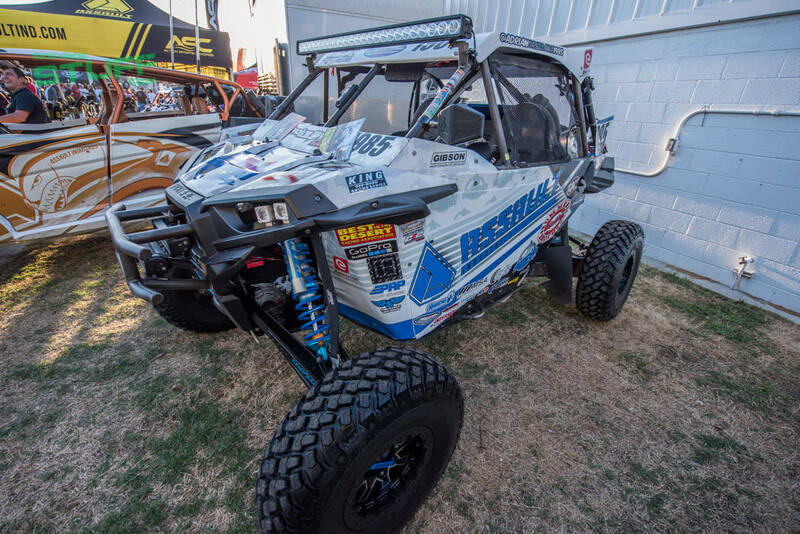 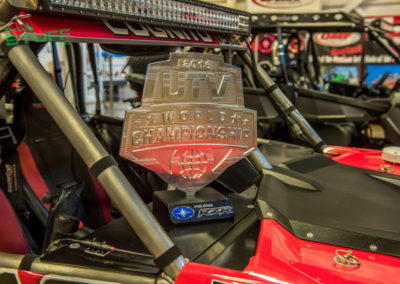 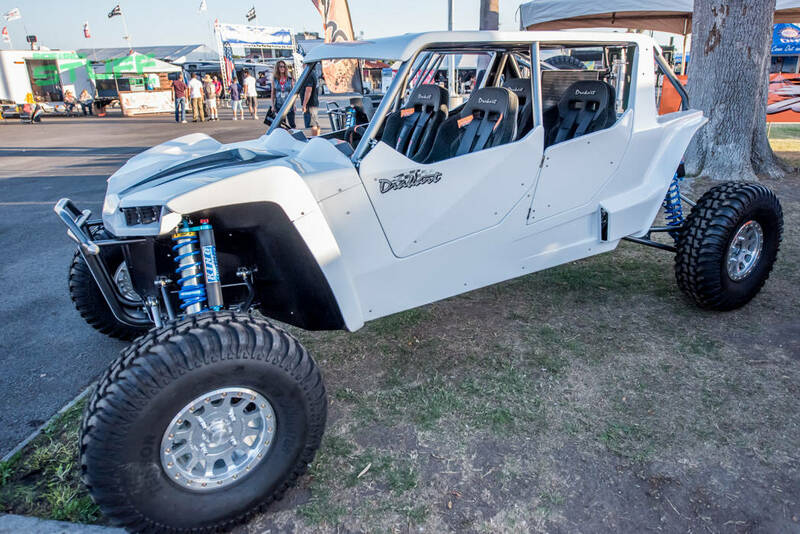 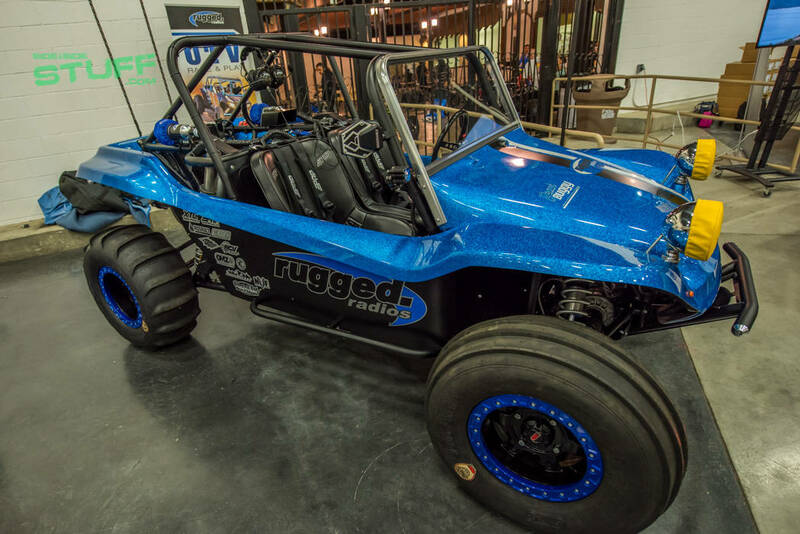 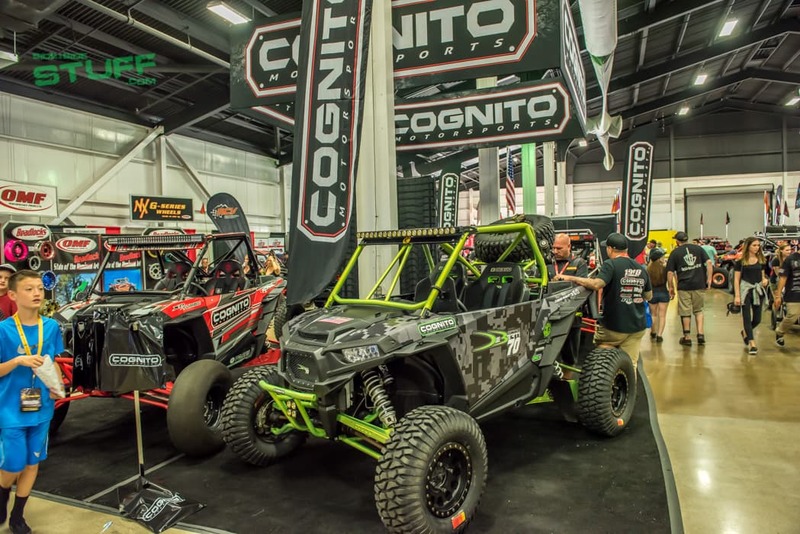 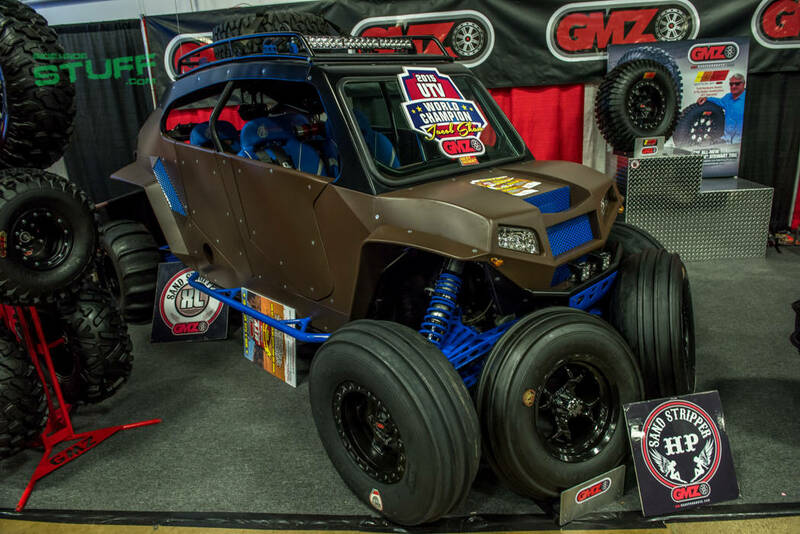 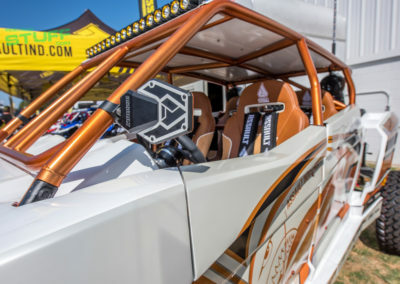 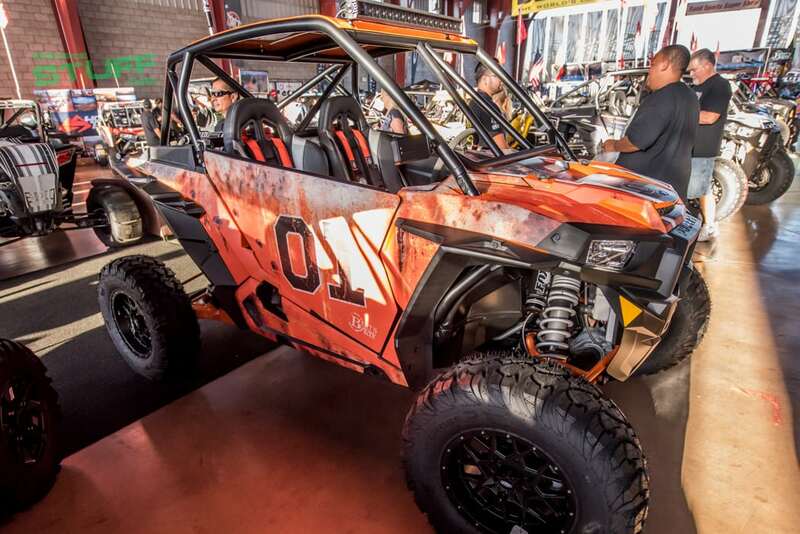 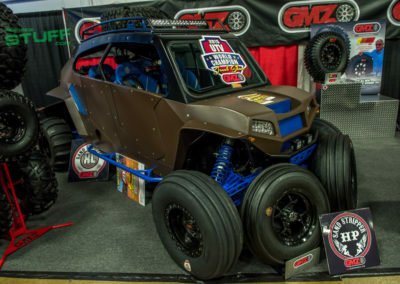 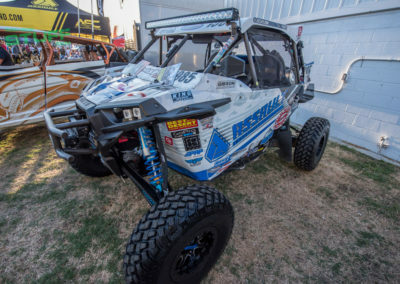 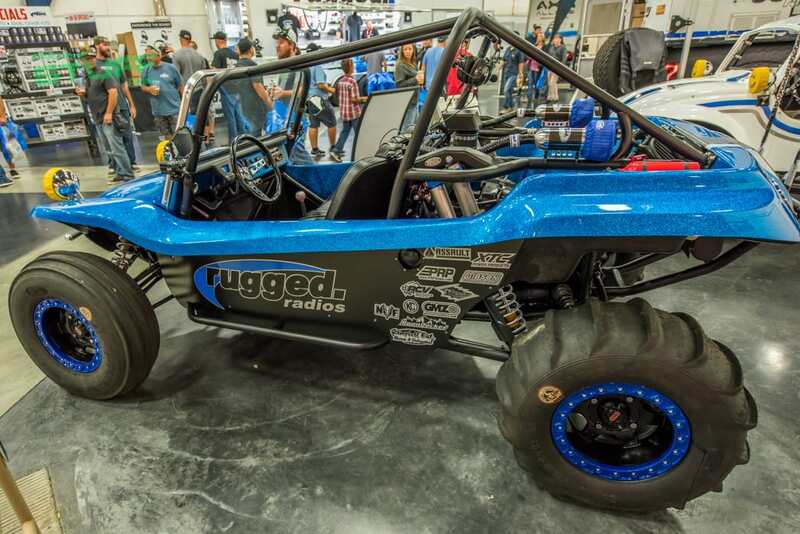 Little did we know, in the last 5 years the sand show had evolved with the exploding UTV industry, it was clear that UTVs dominated at the event as 90% of the displays were UTV products and builds. 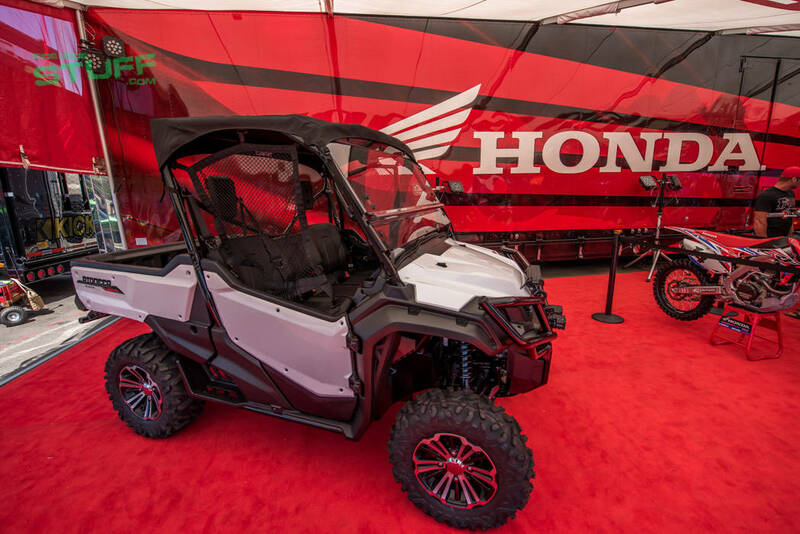 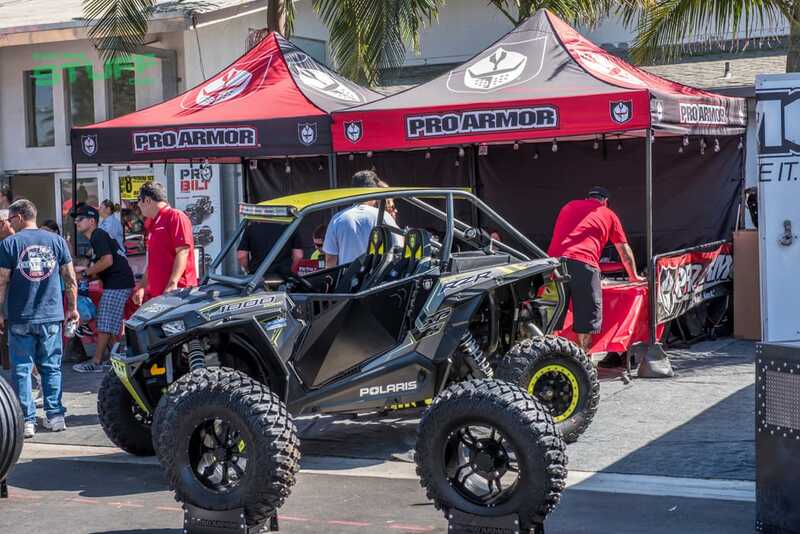 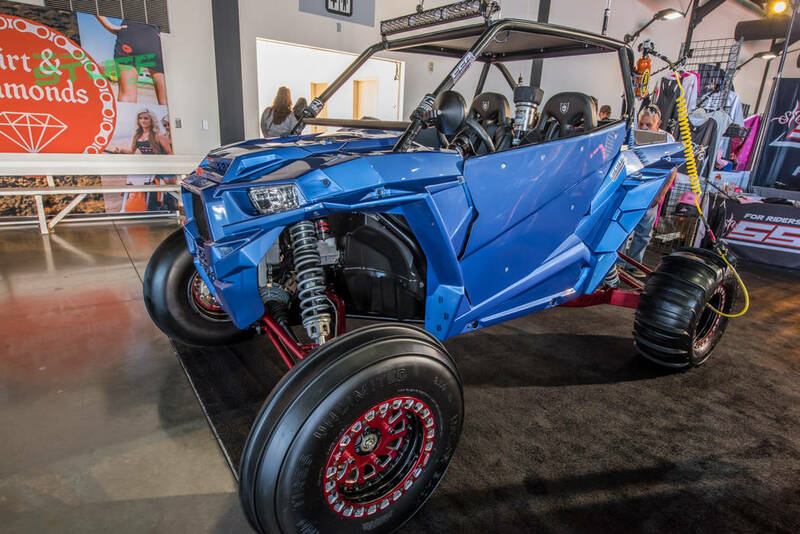 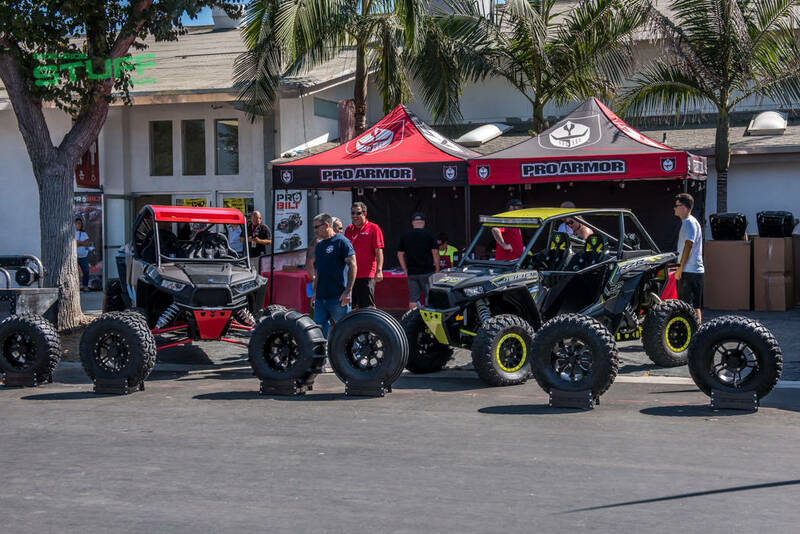 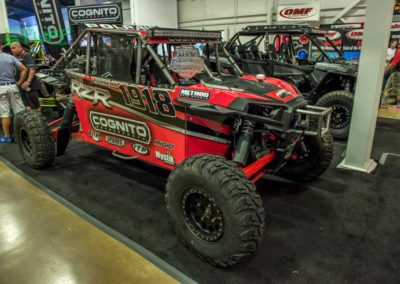 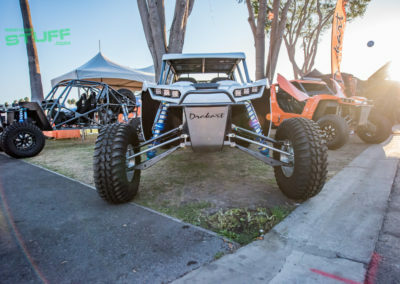 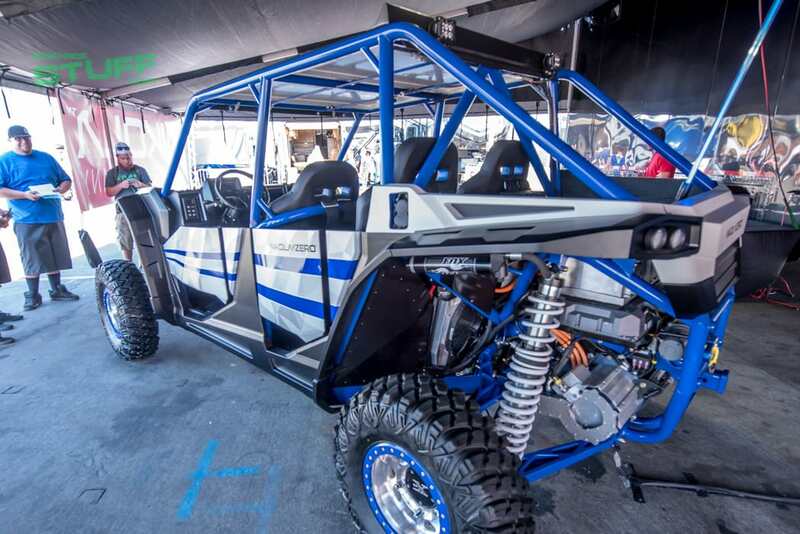 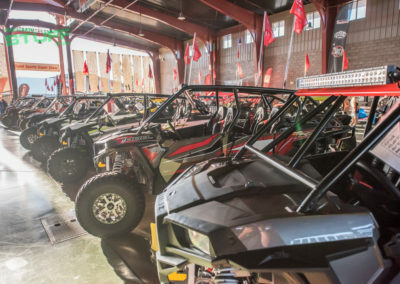 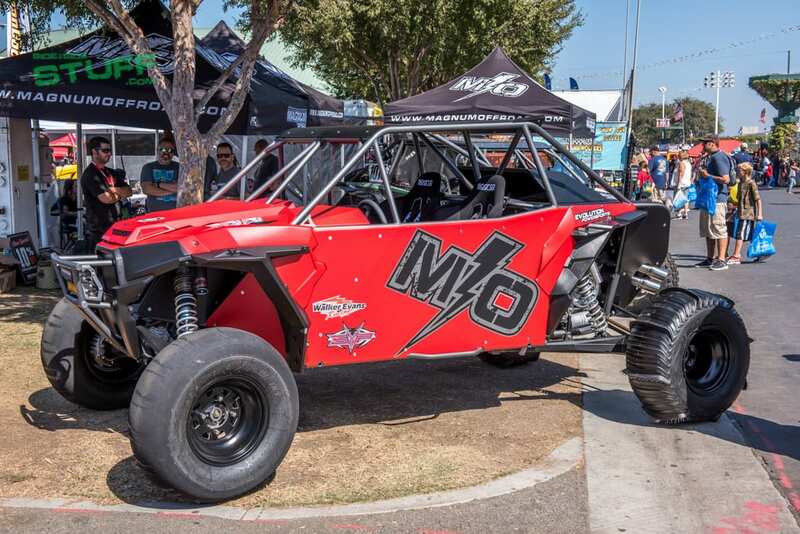 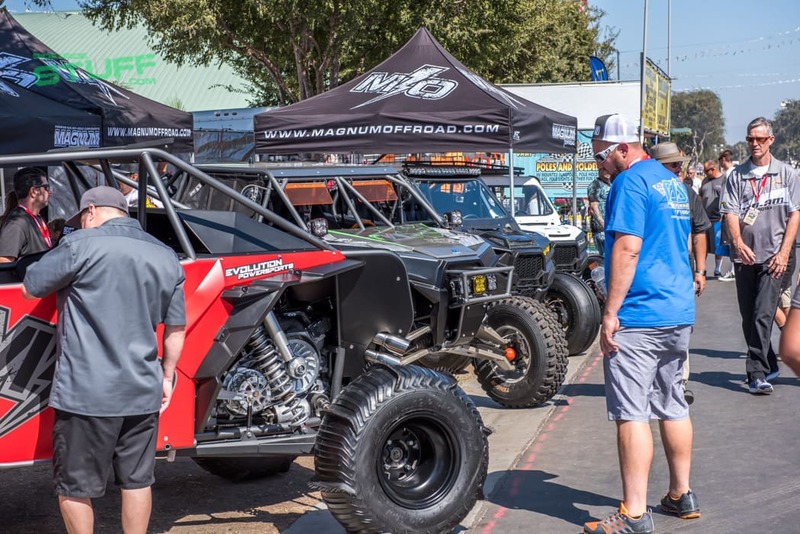 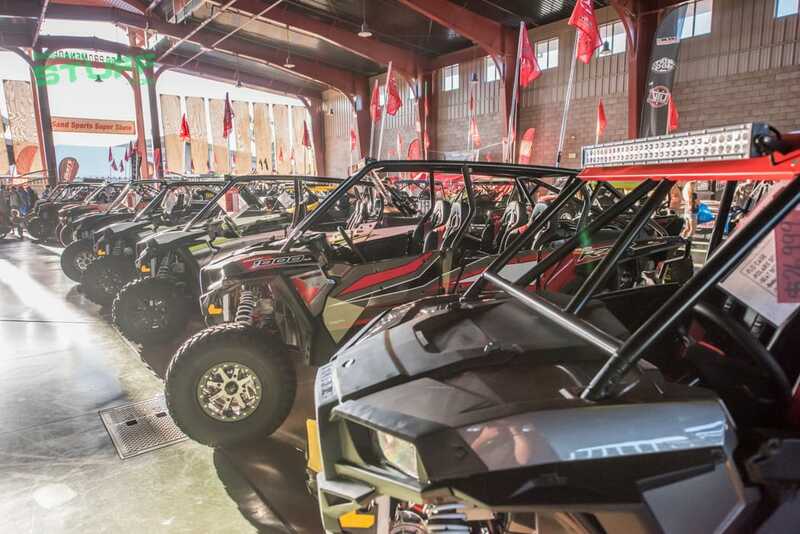 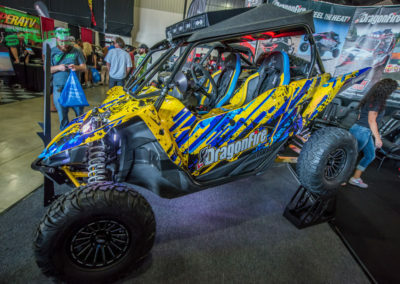 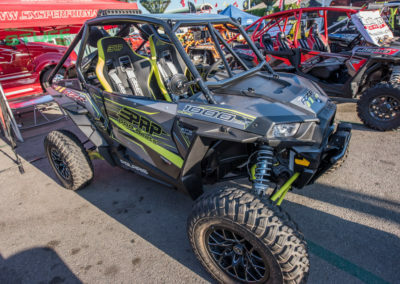 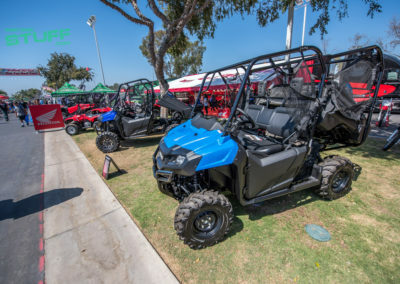 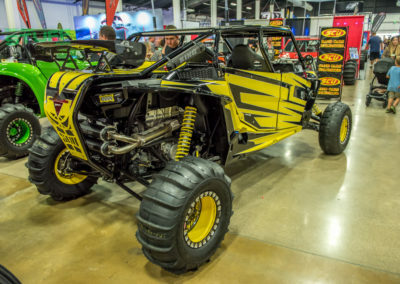 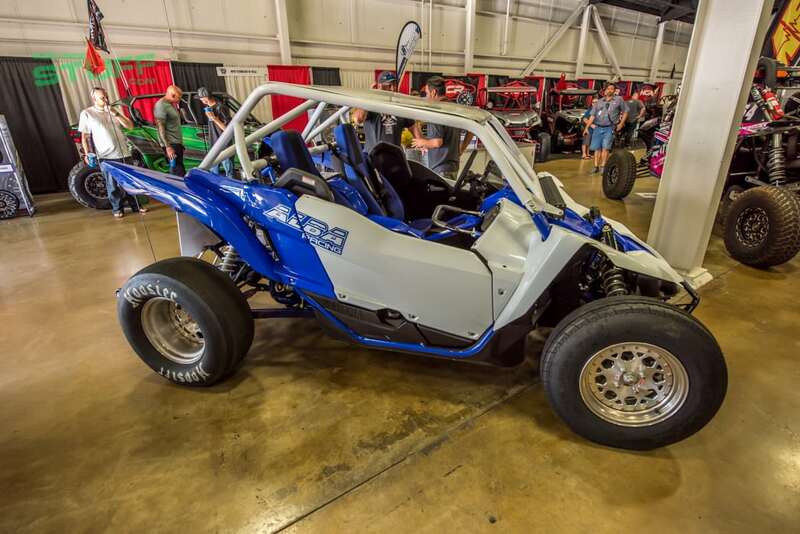 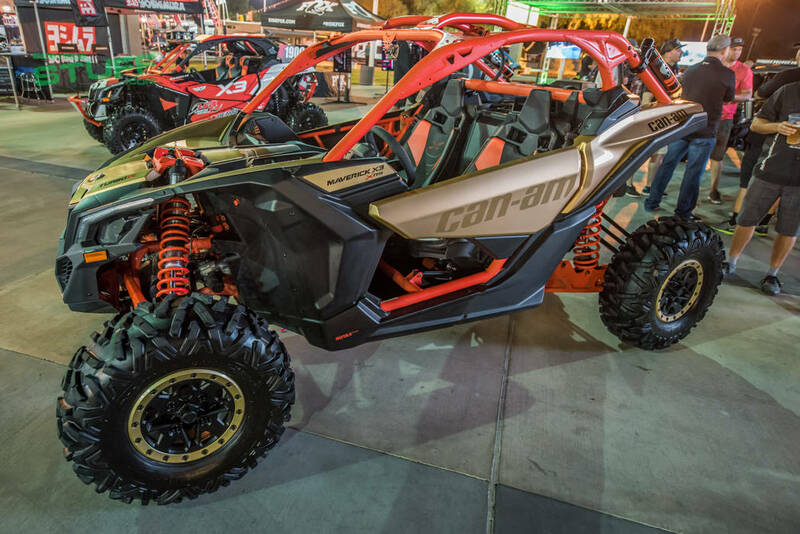 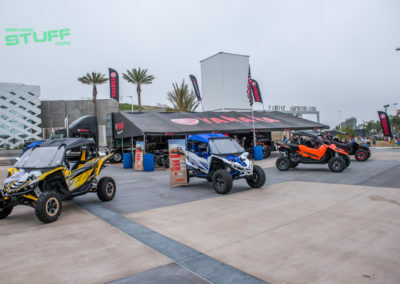 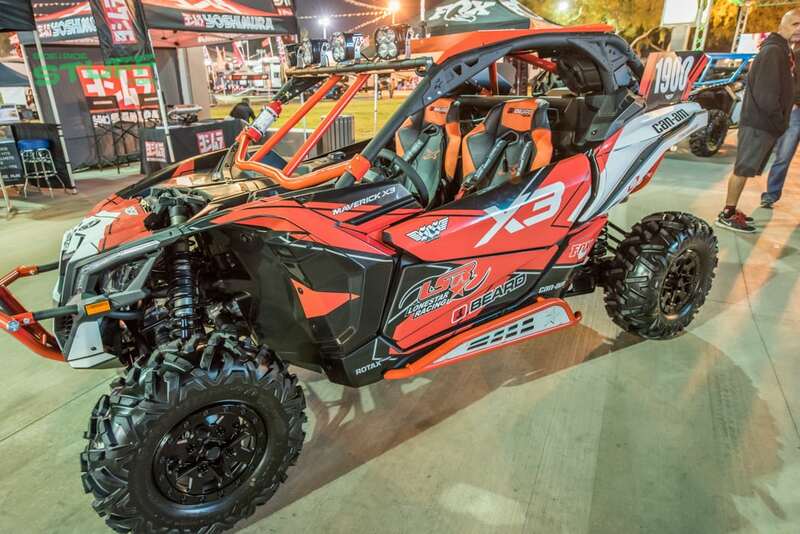 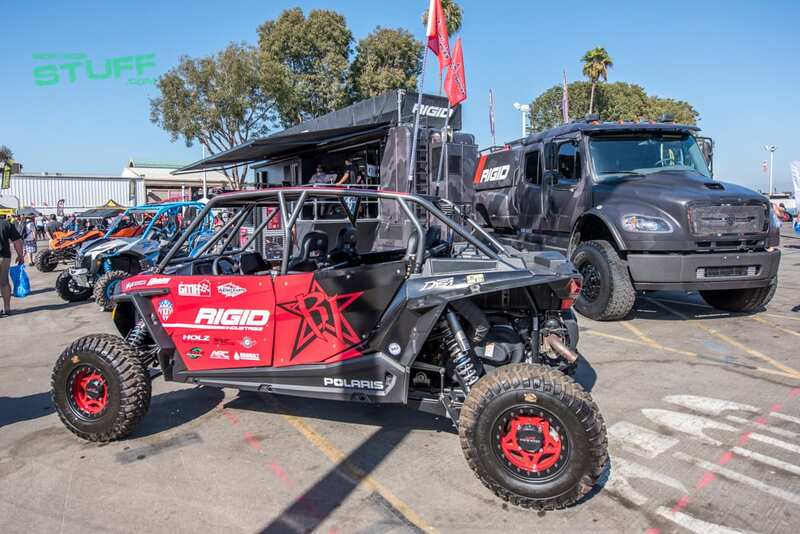 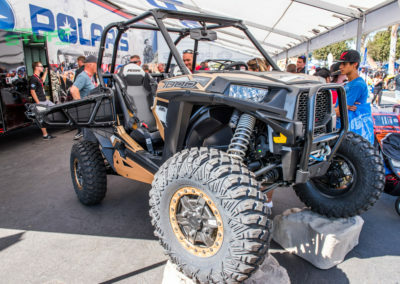 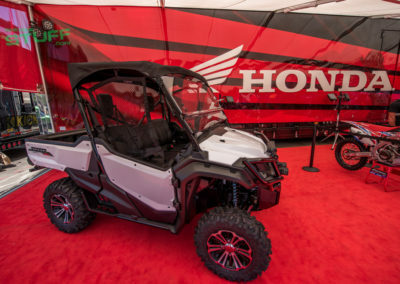 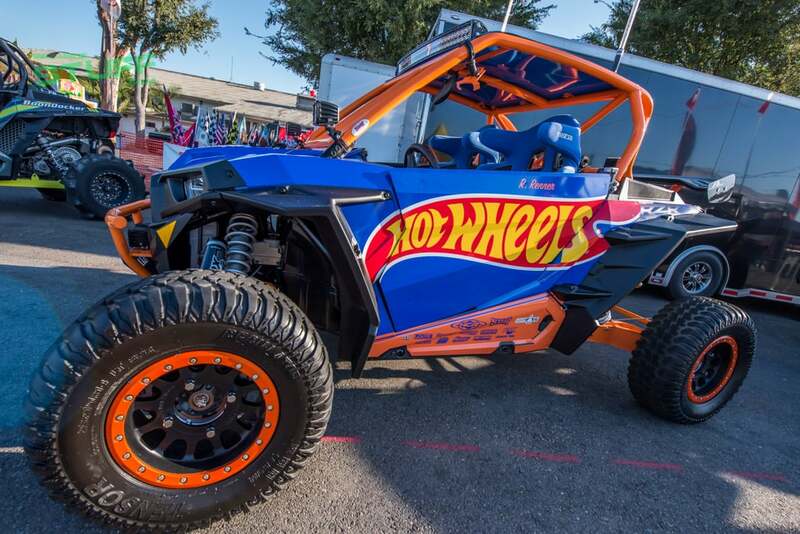 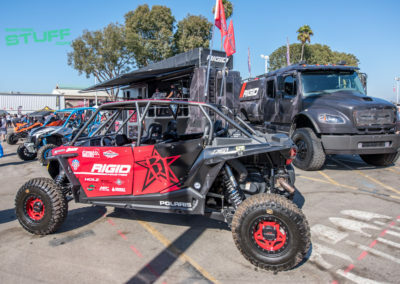 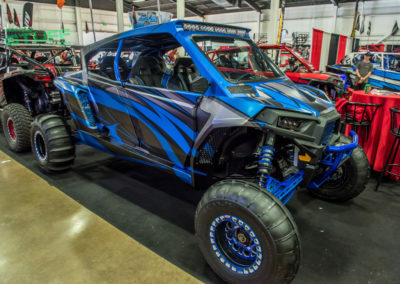 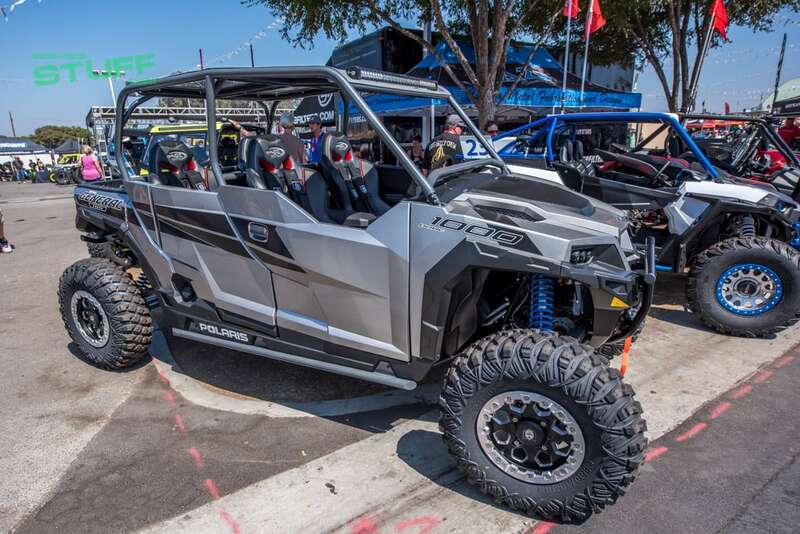 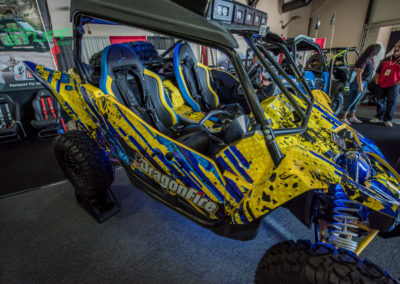 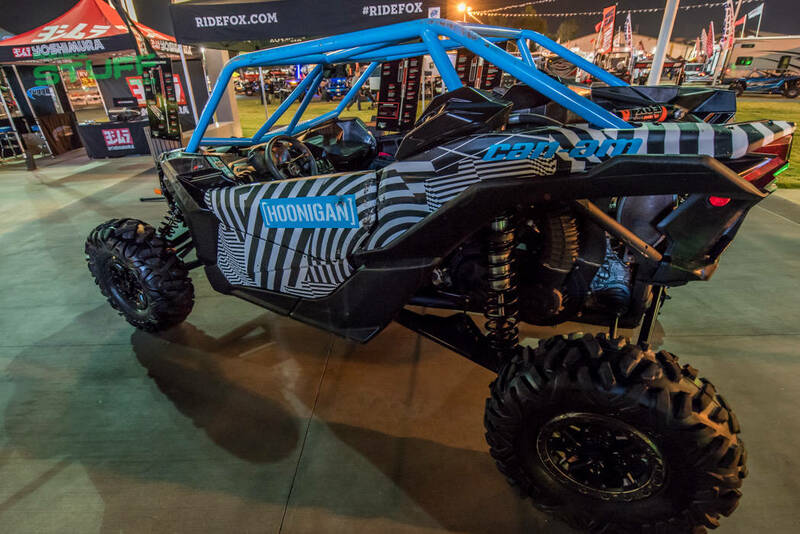 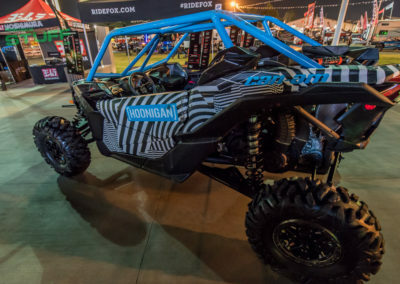 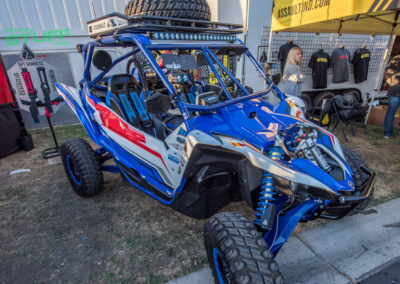 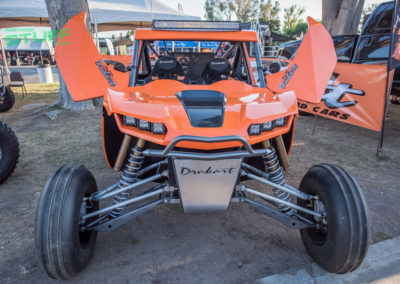 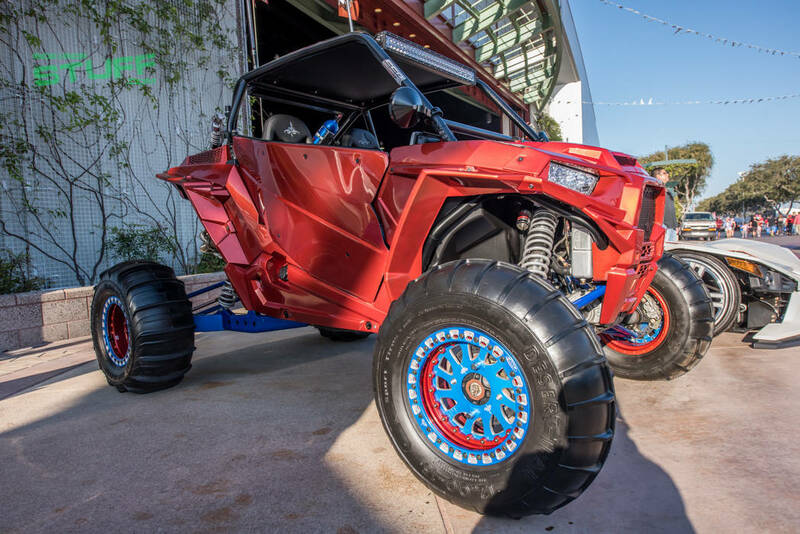 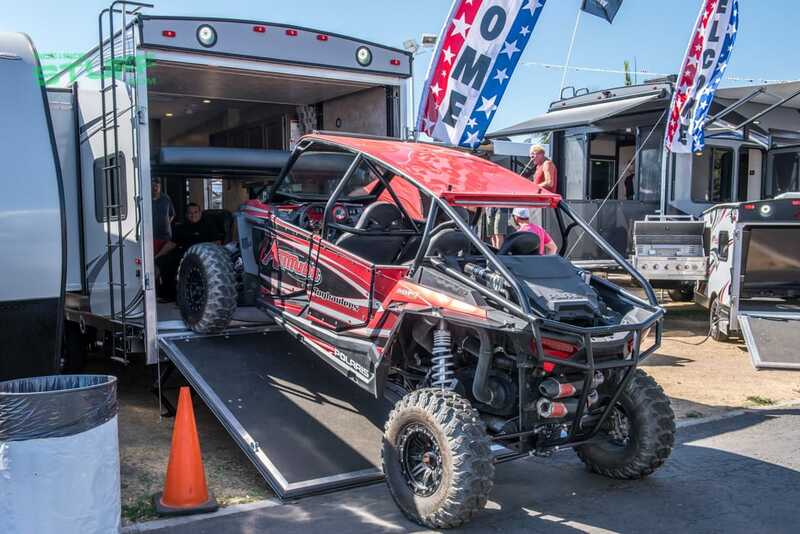 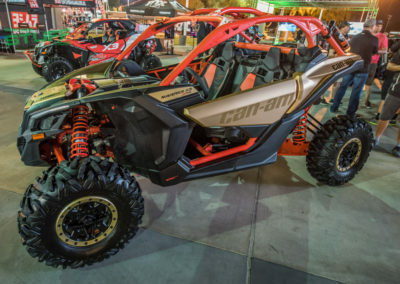 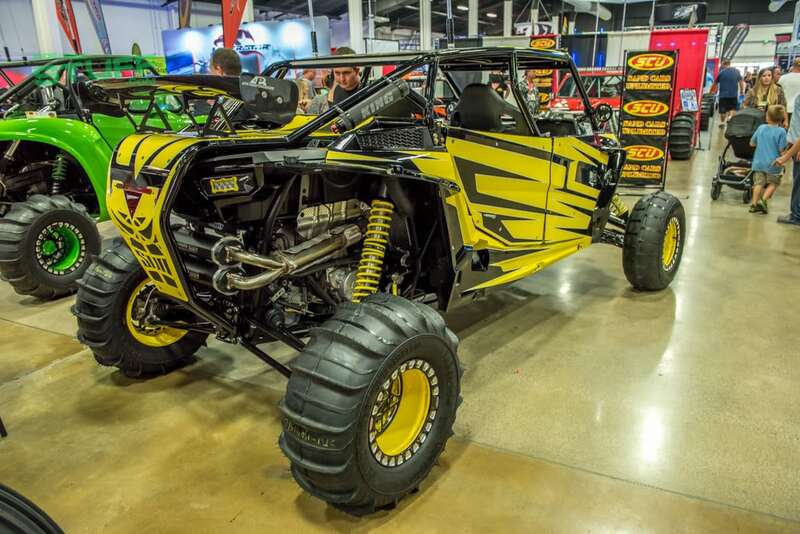 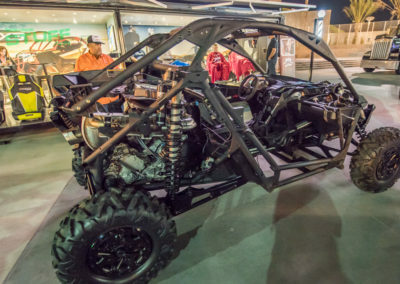 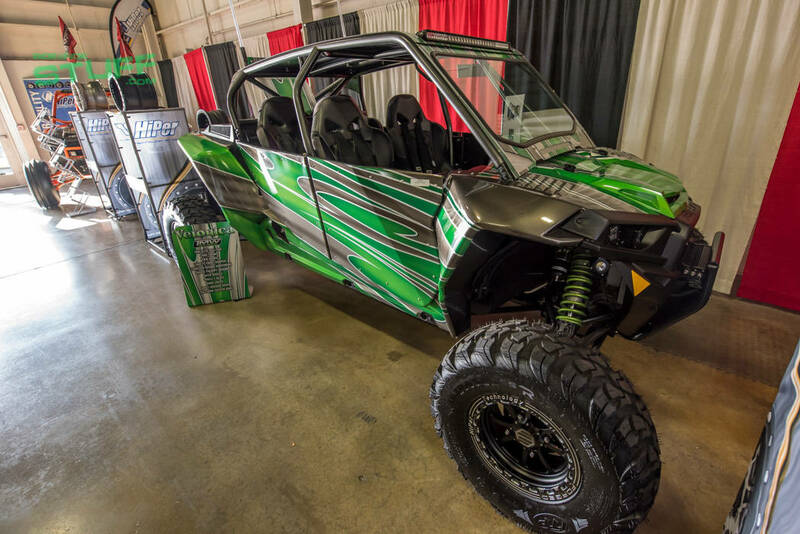 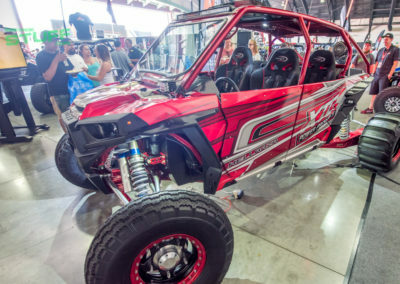 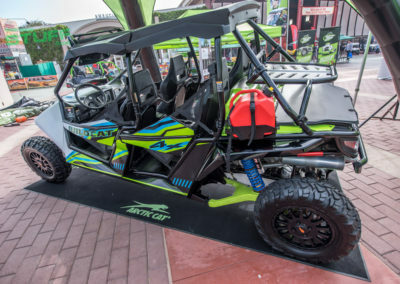 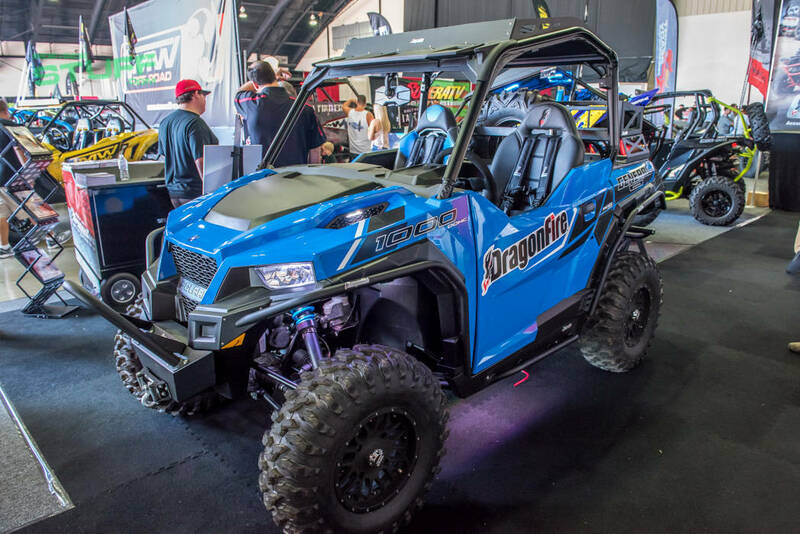 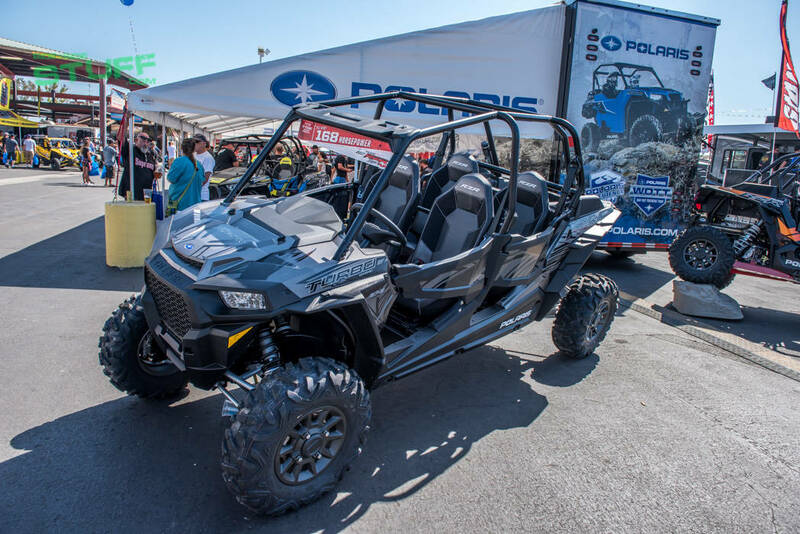 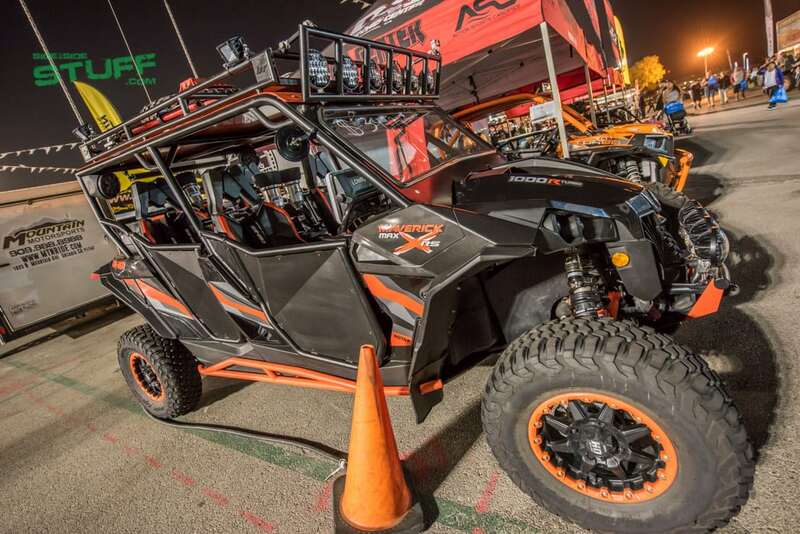 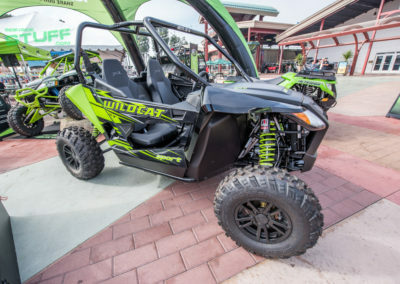 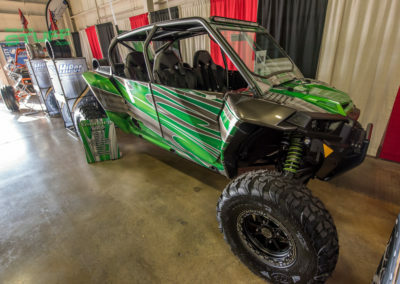 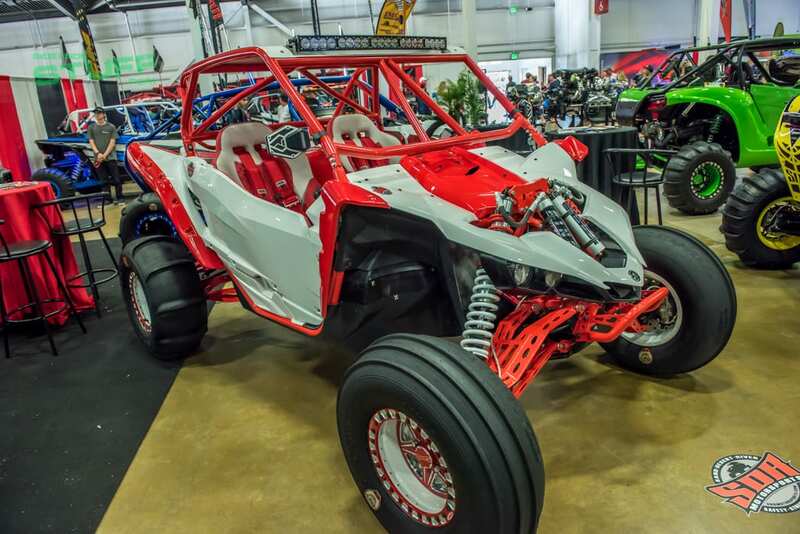 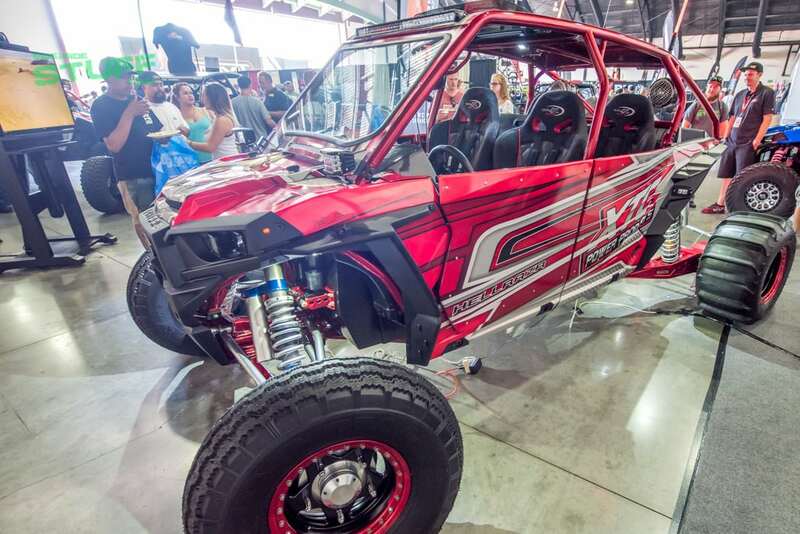 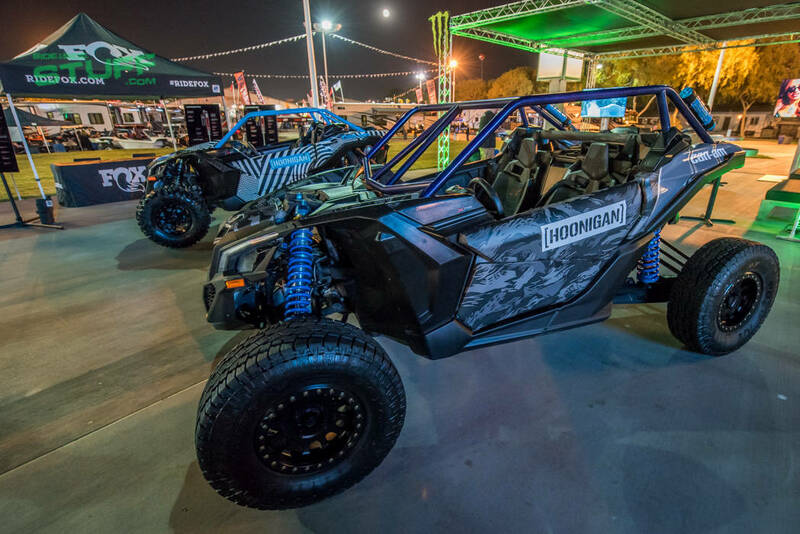 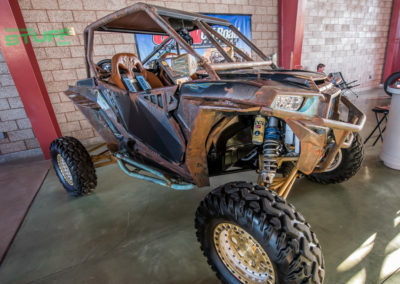 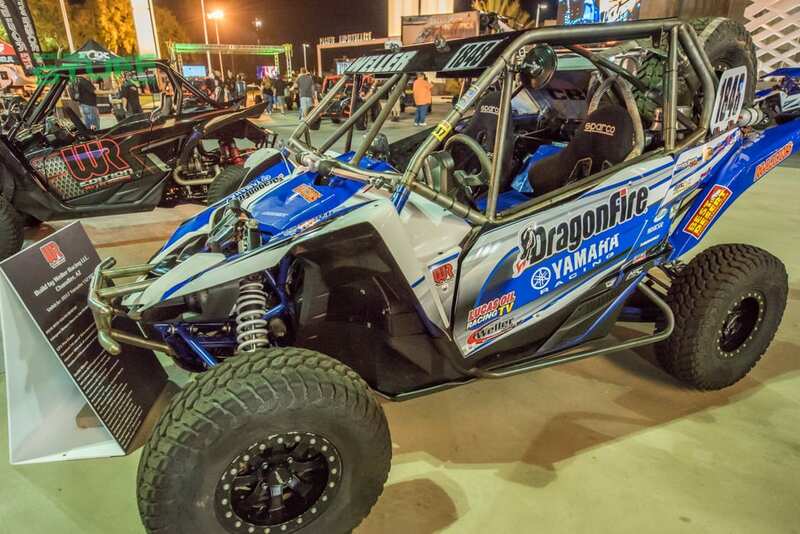 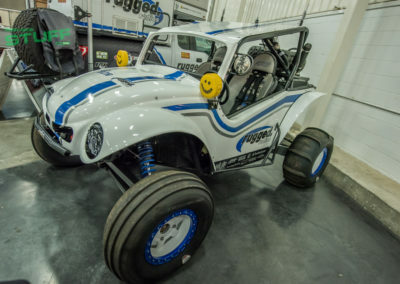 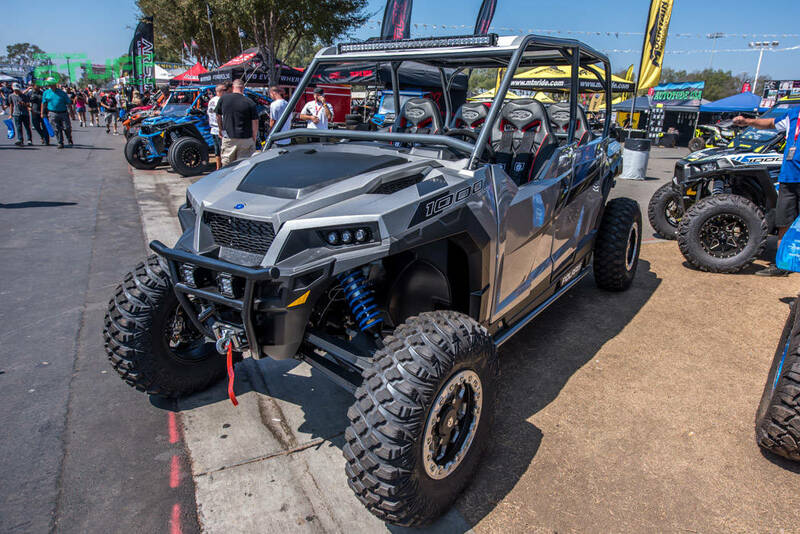 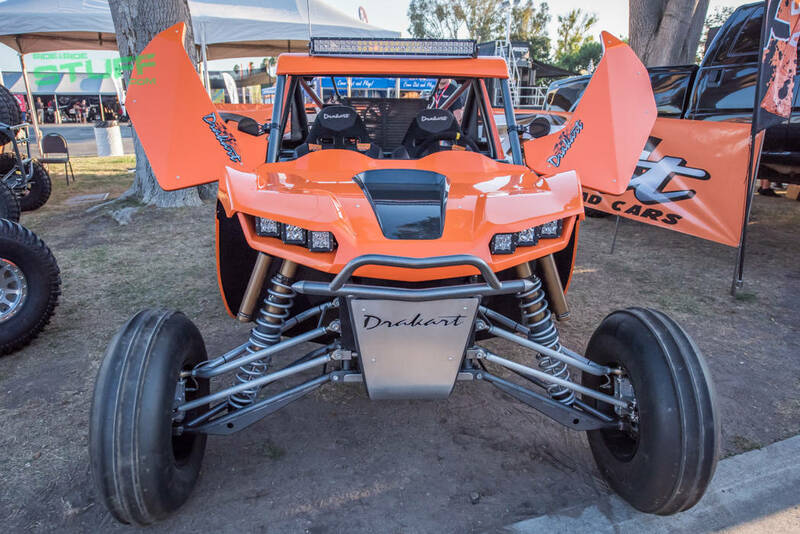 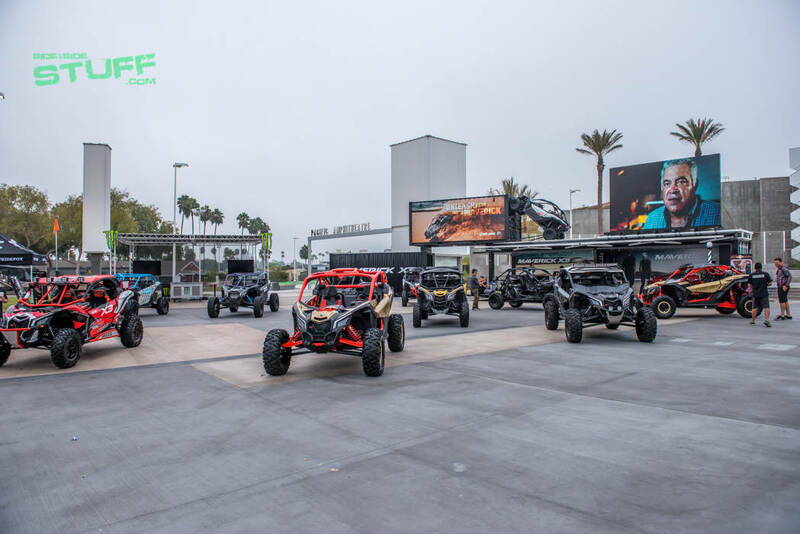 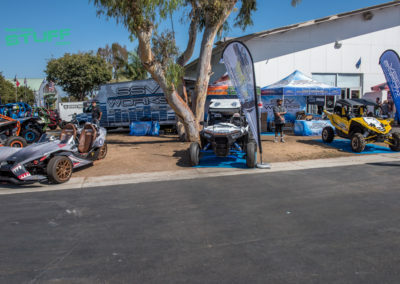 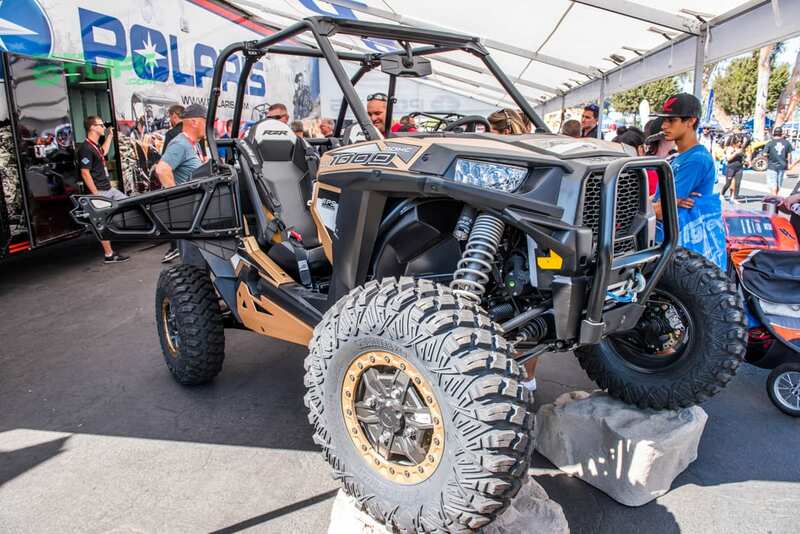 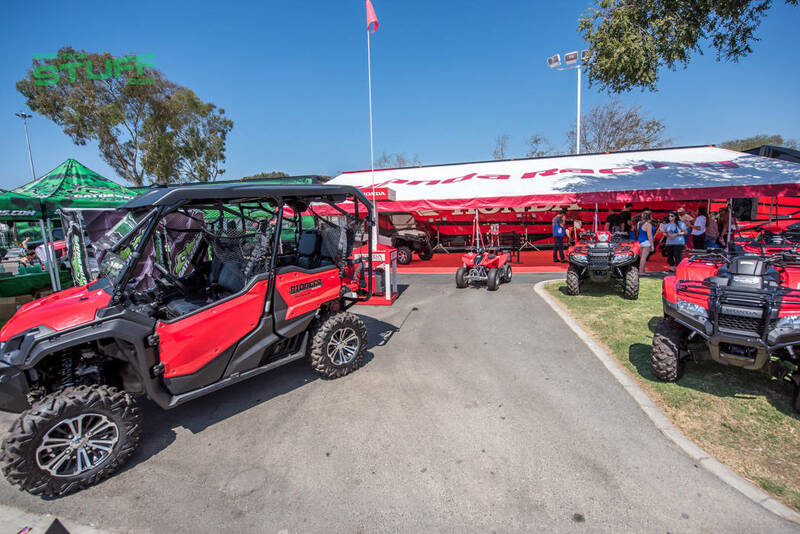 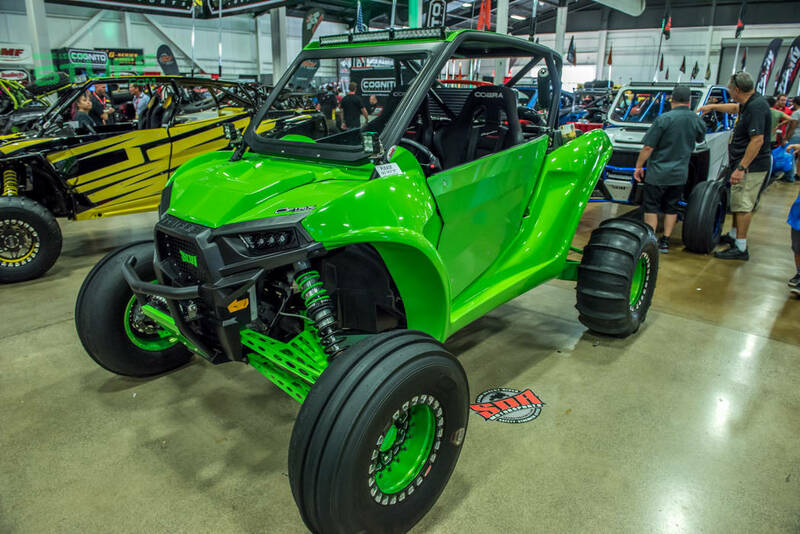 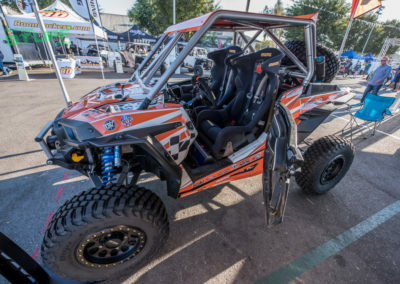 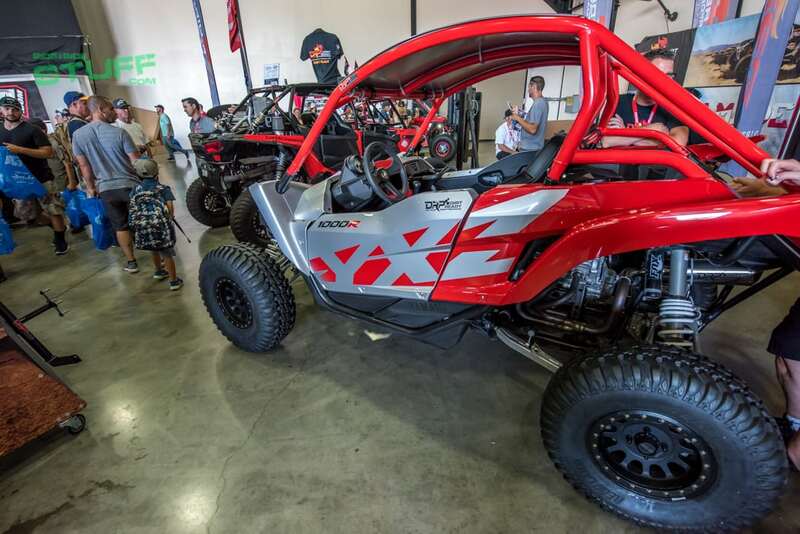 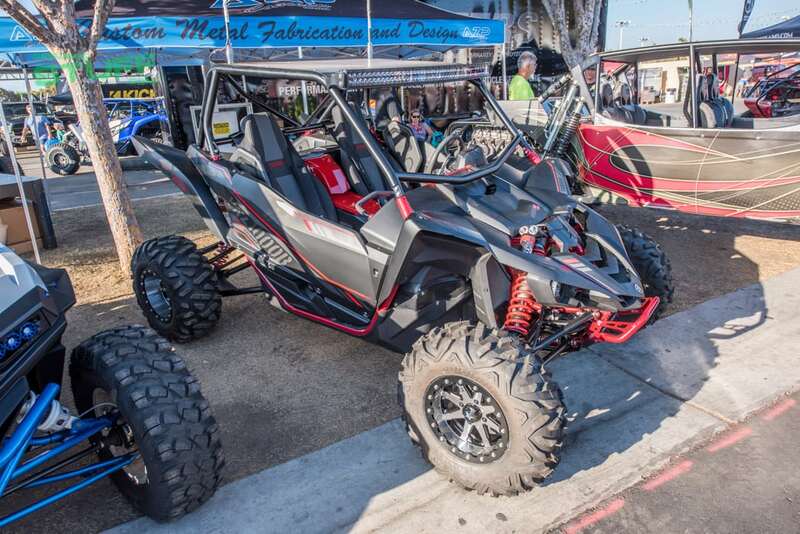 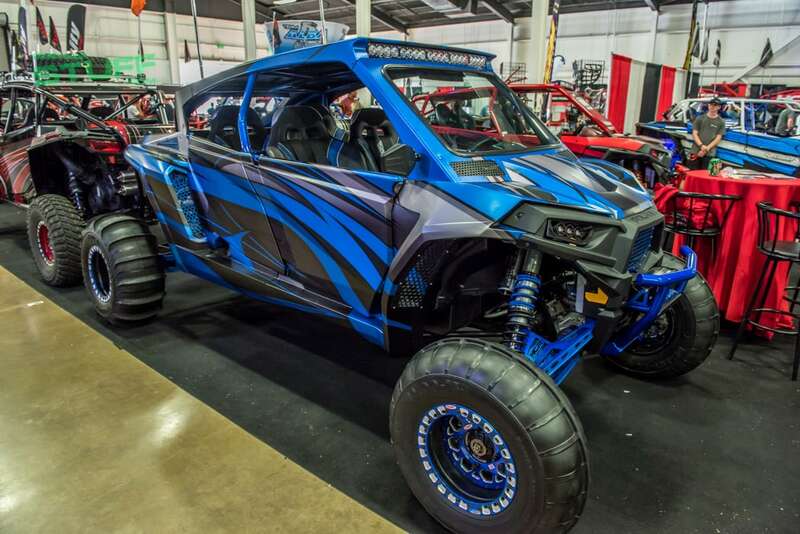 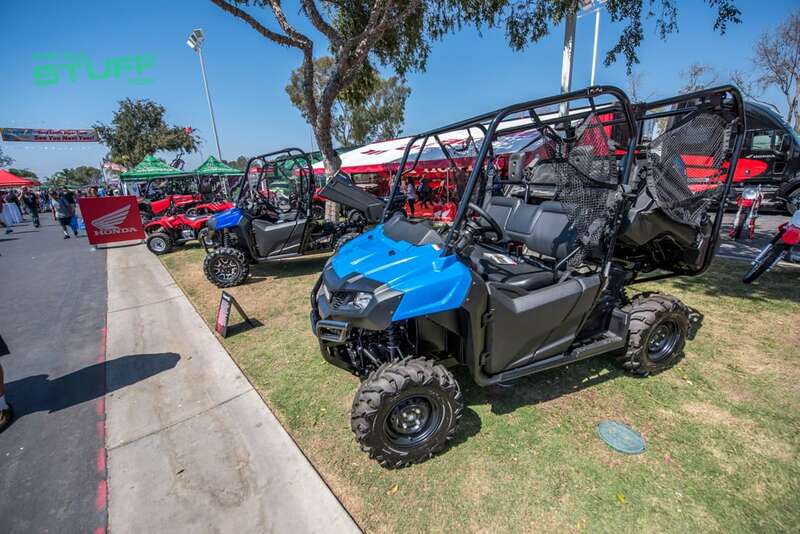 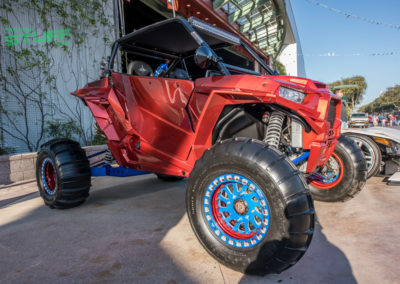 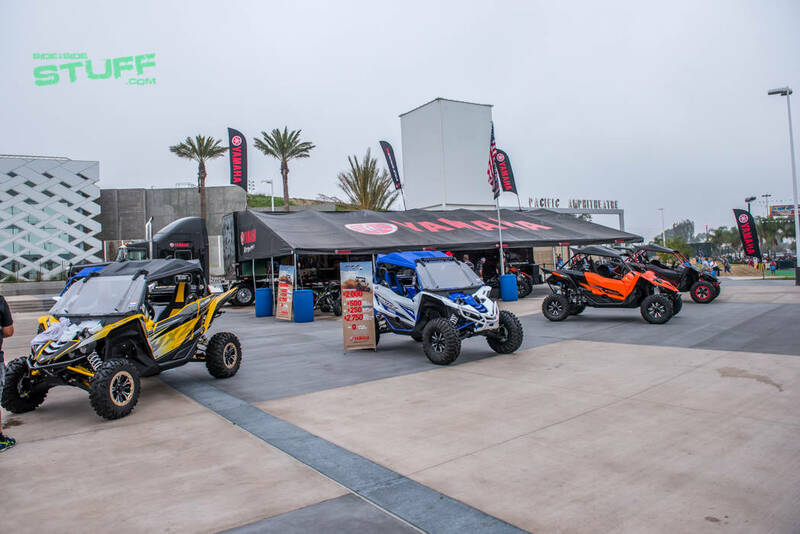 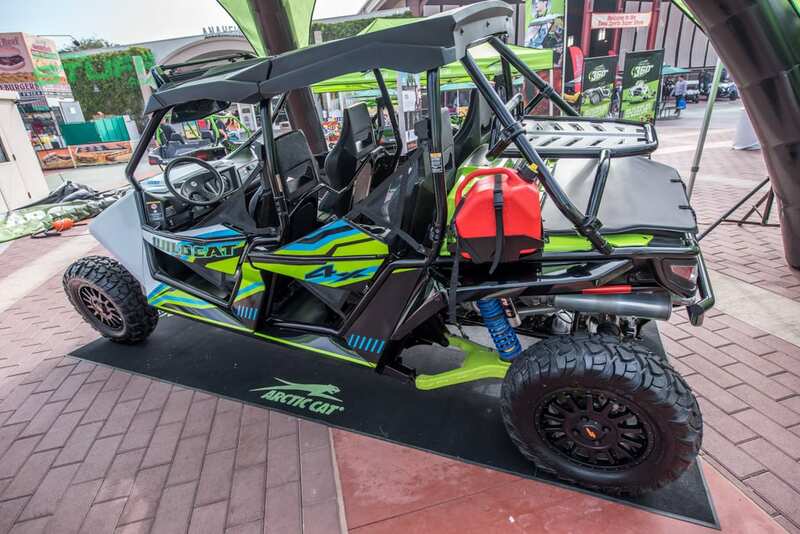 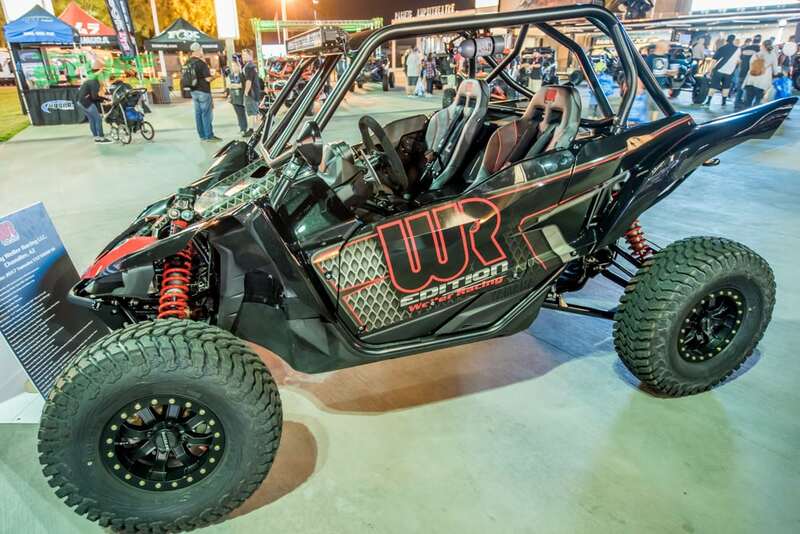 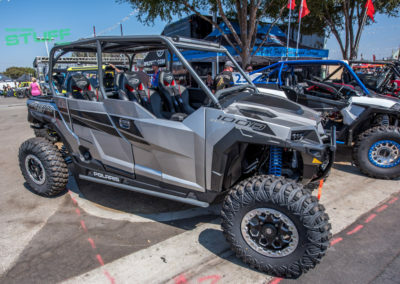 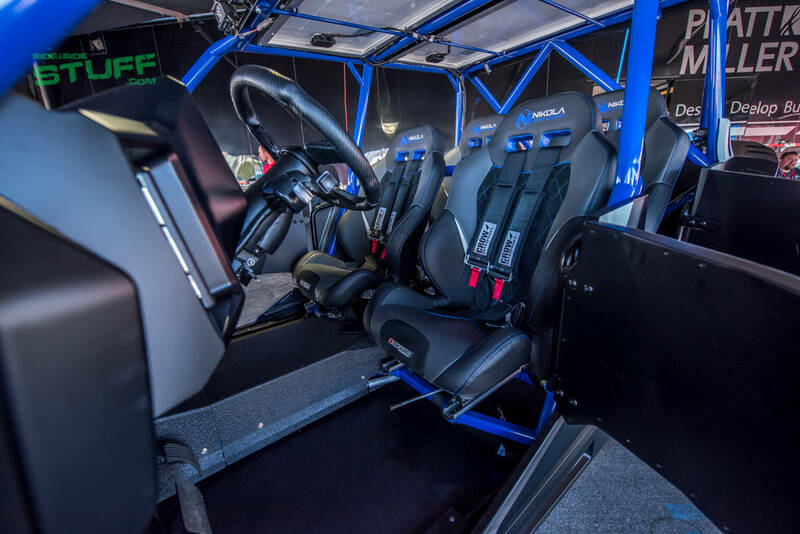 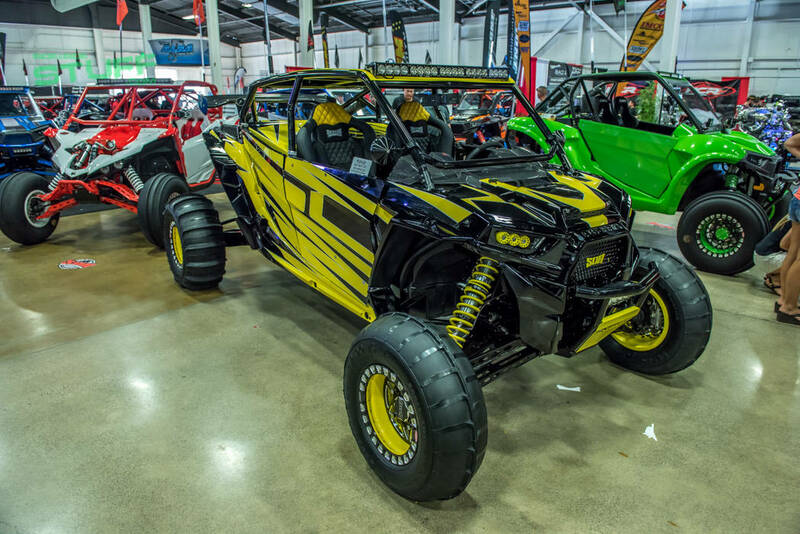 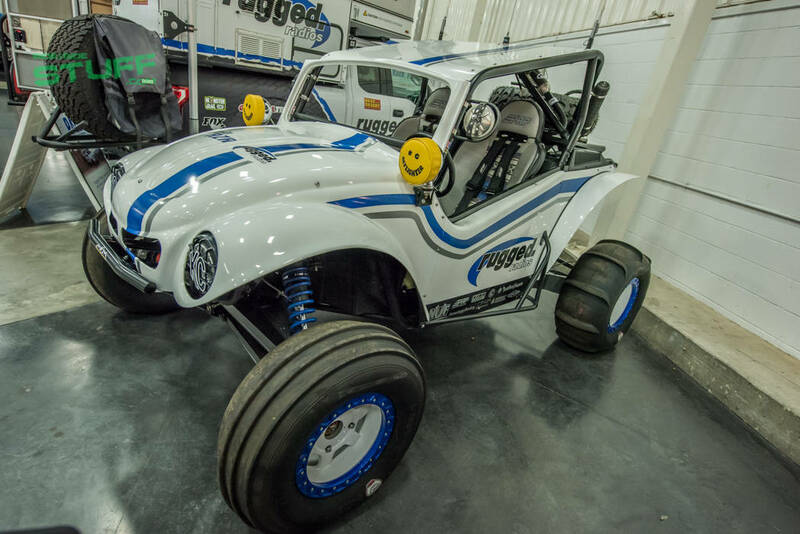 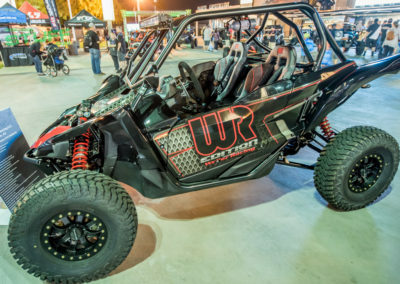 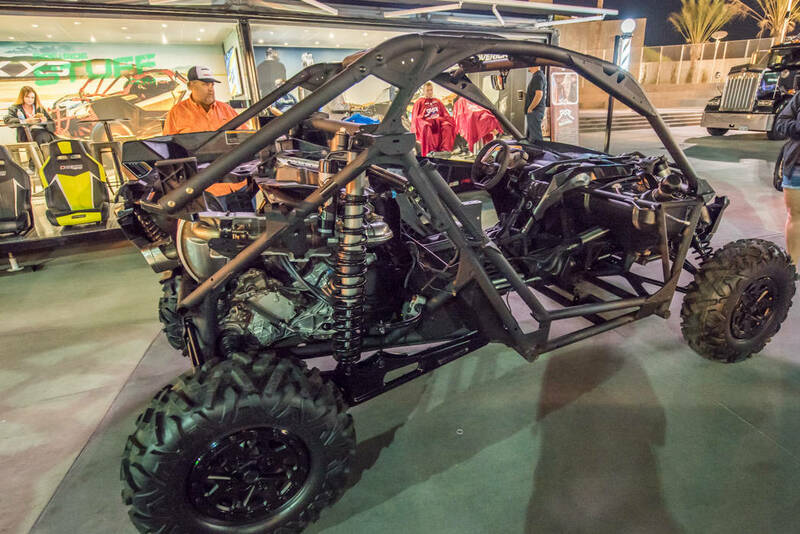 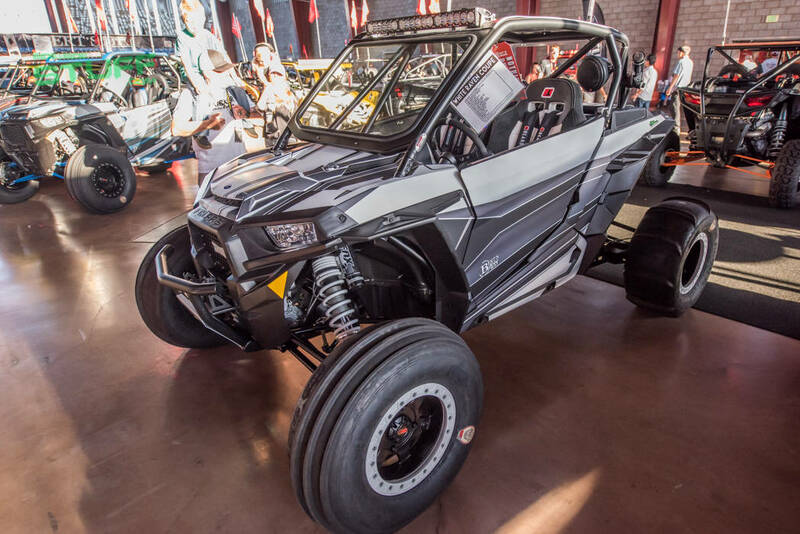 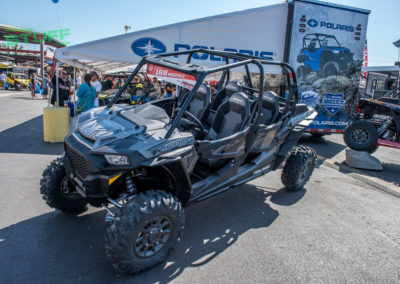 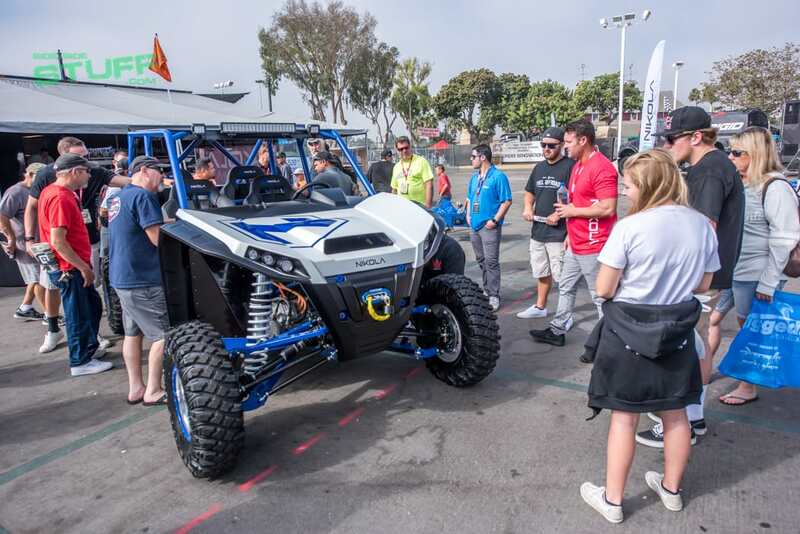 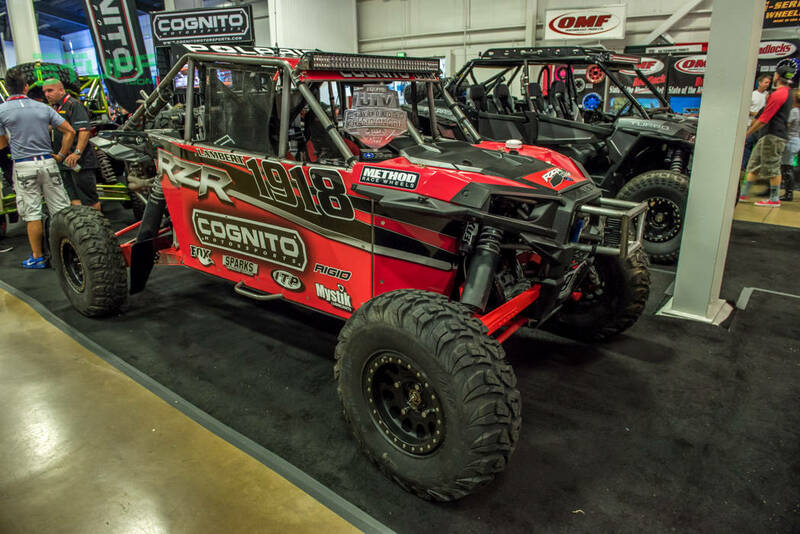 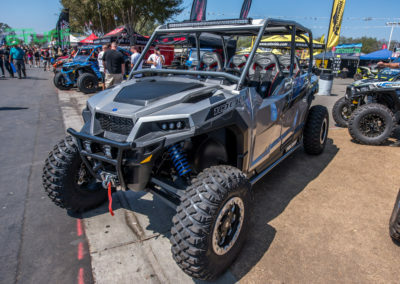 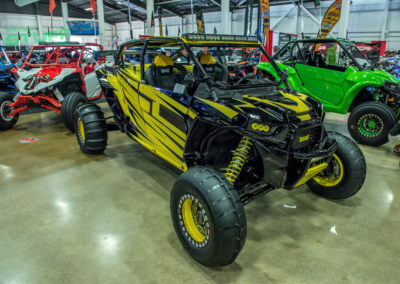 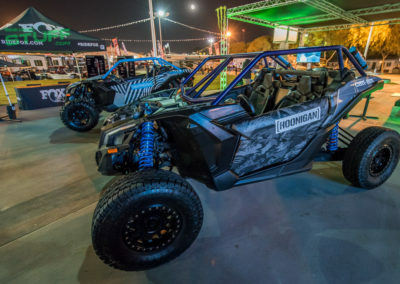 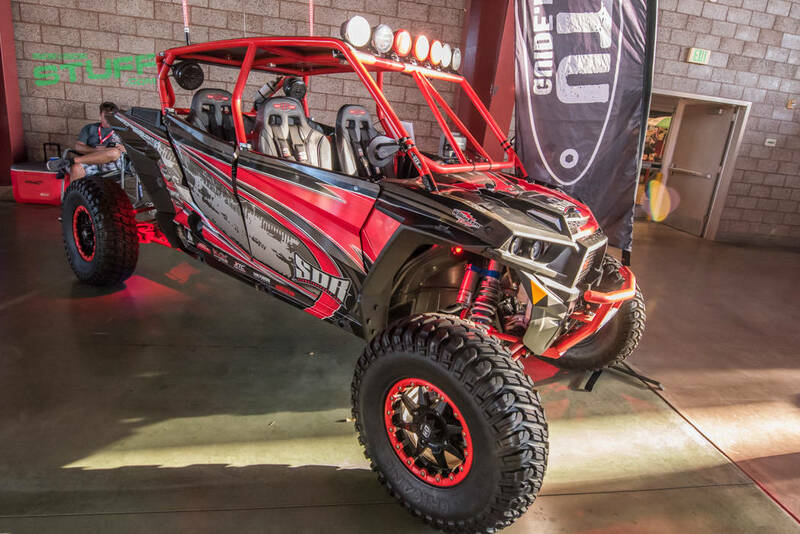 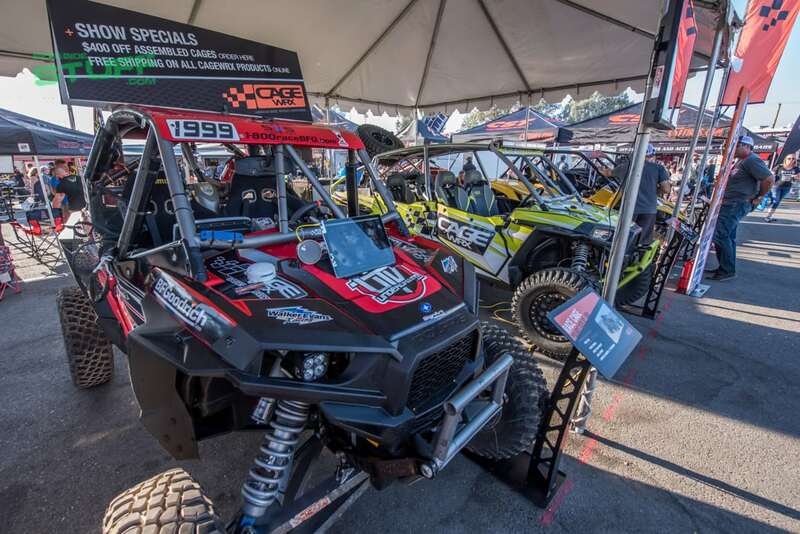 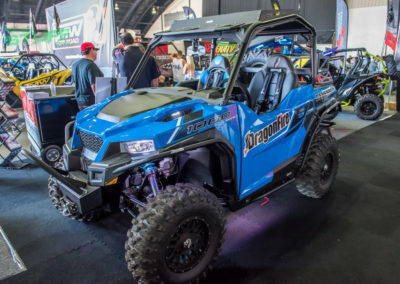 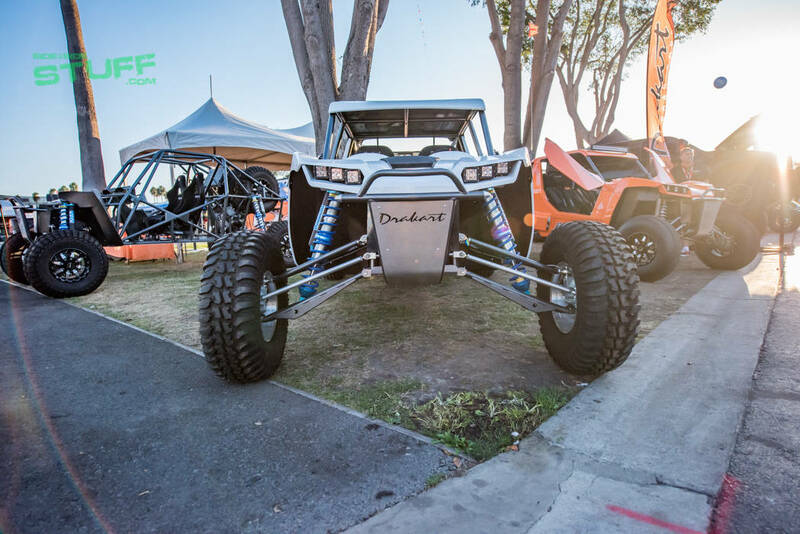 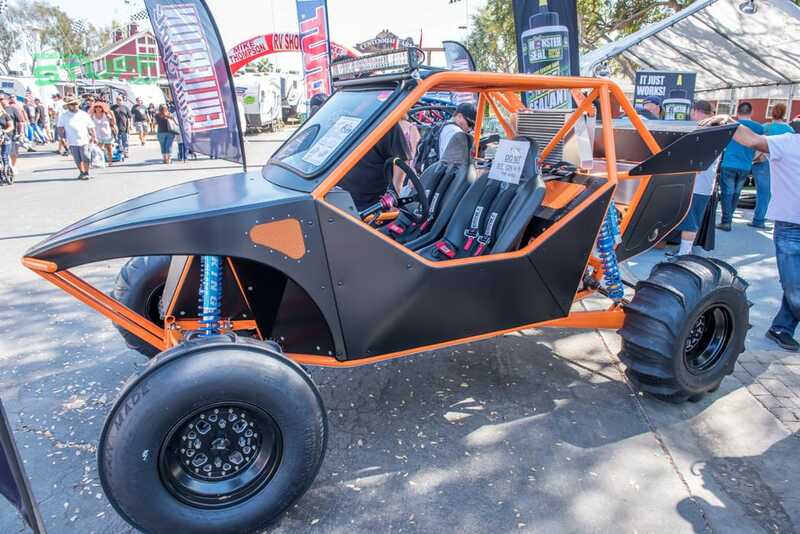 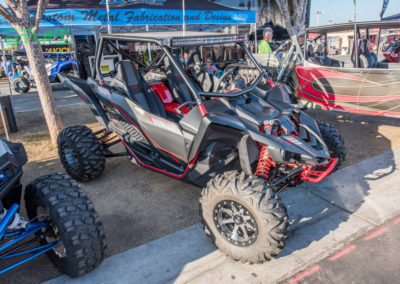 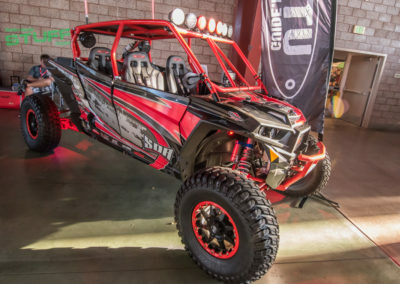 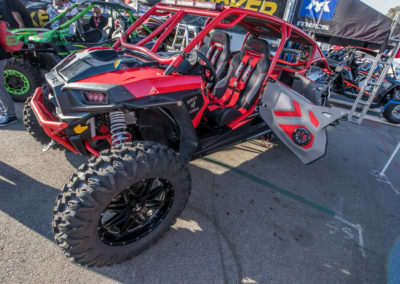 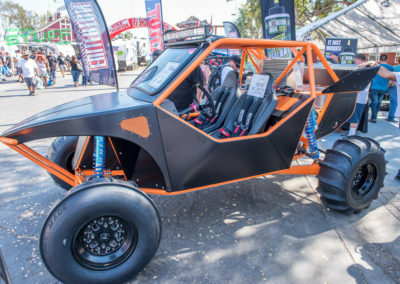 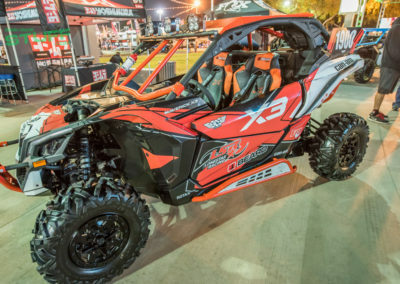 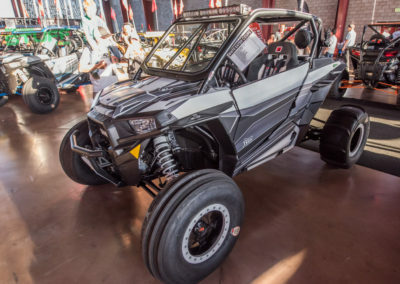 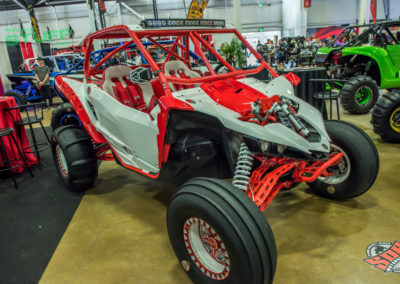 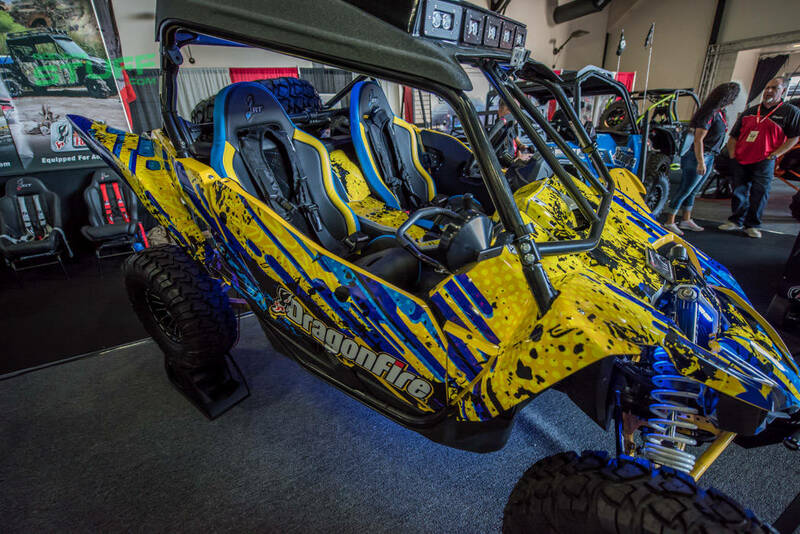 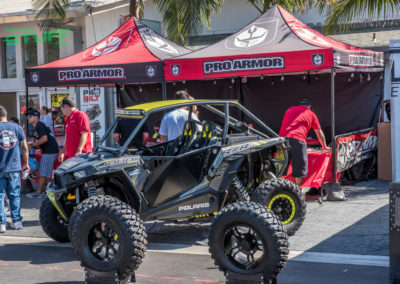 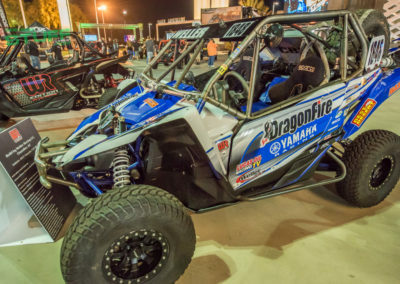 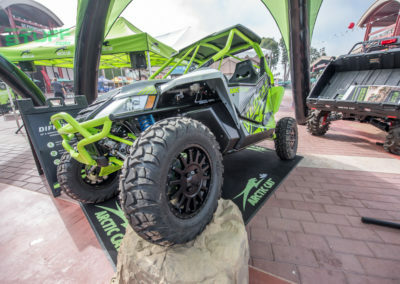 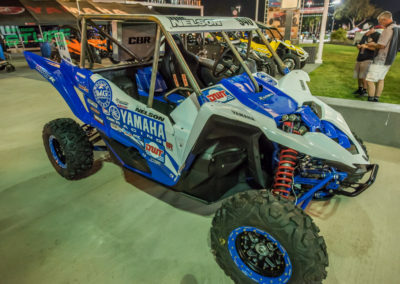 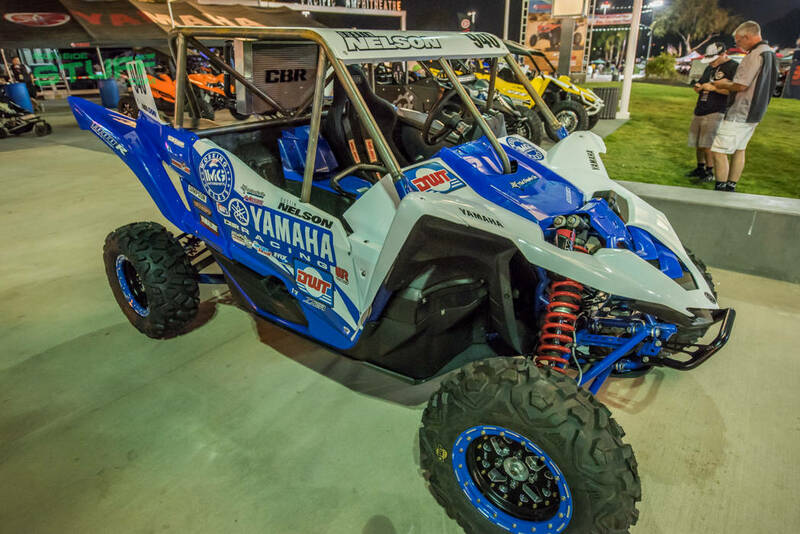 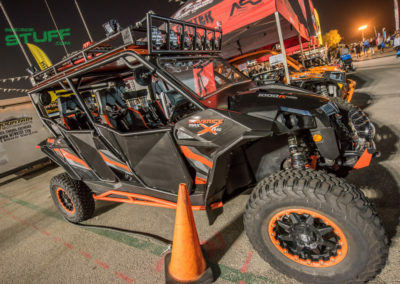 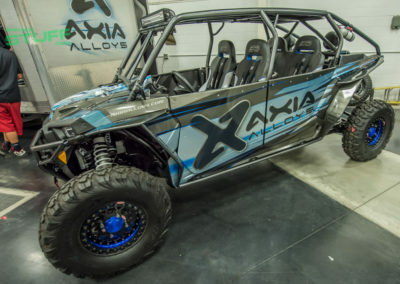 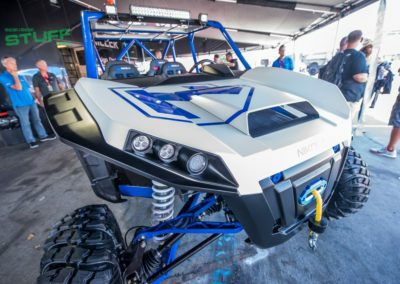 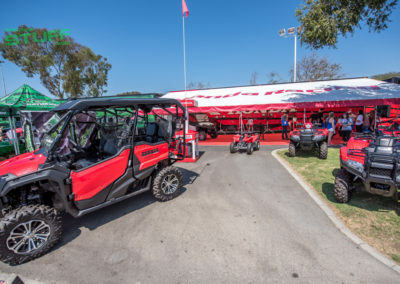 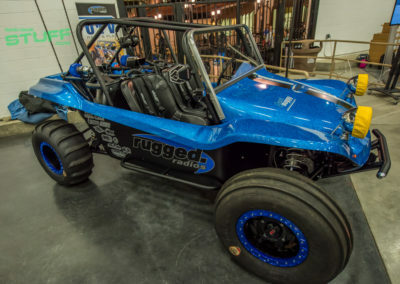 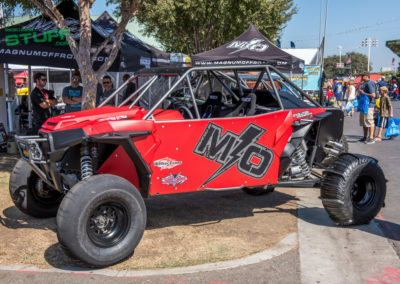 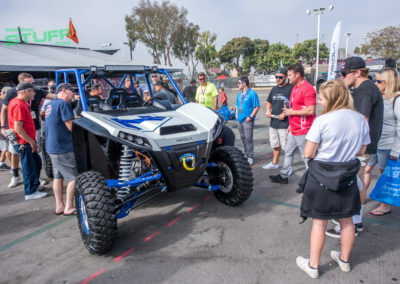 OEMs like Honda, Yamaha and Can Am displayed their newest fleet of machines; attendees were able to check out the new machines including the Can-Am Maverick X3, Yamaha YXZ 1000 R SS and the Honda Pioneer 1000. 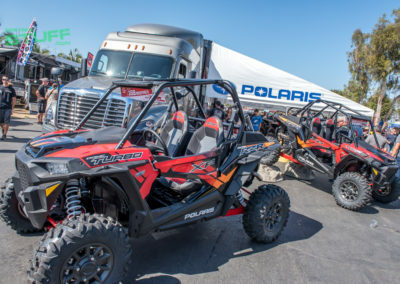 Polaris and Arctic Cat displayed their new fleet of machines as well, they also debuted brand new machines at the show. 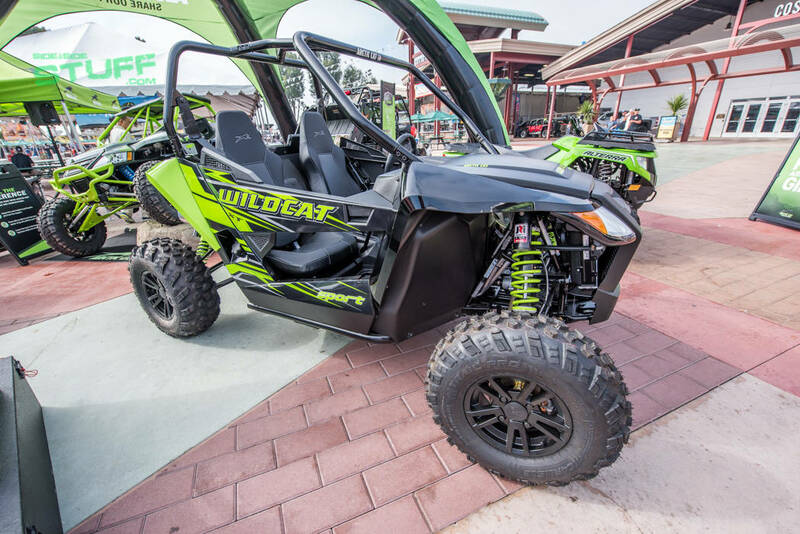 Arctic Cat unveiled their new Wildcat X Limited Edition models with the RG Pro Suspension. 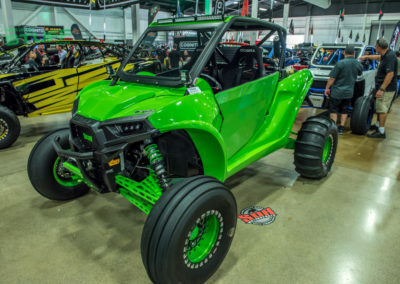 Racing legend Robby Gordon made an appearance for Arctic Cat’s launch of the new machine, as you may of suspected Gordon helped developed the new machine hence the “RG” in RG Pro Suspension. 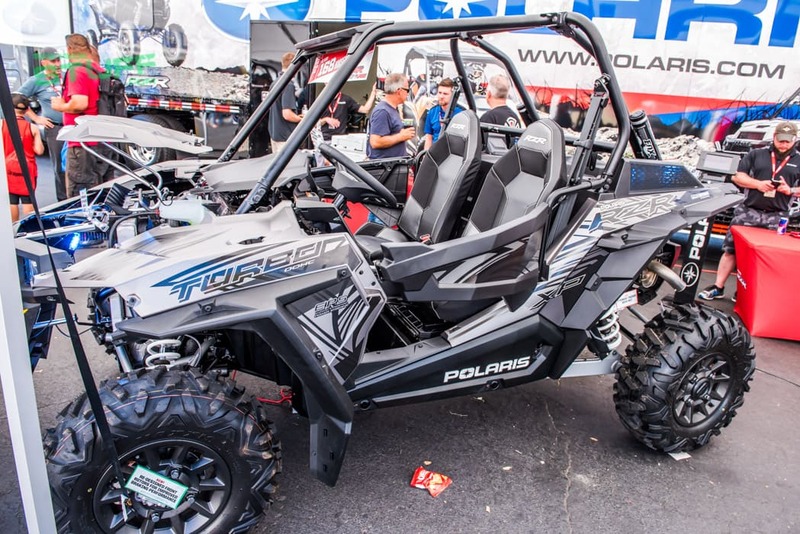 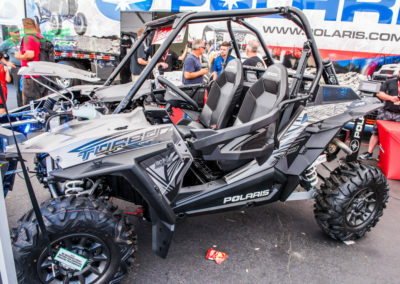 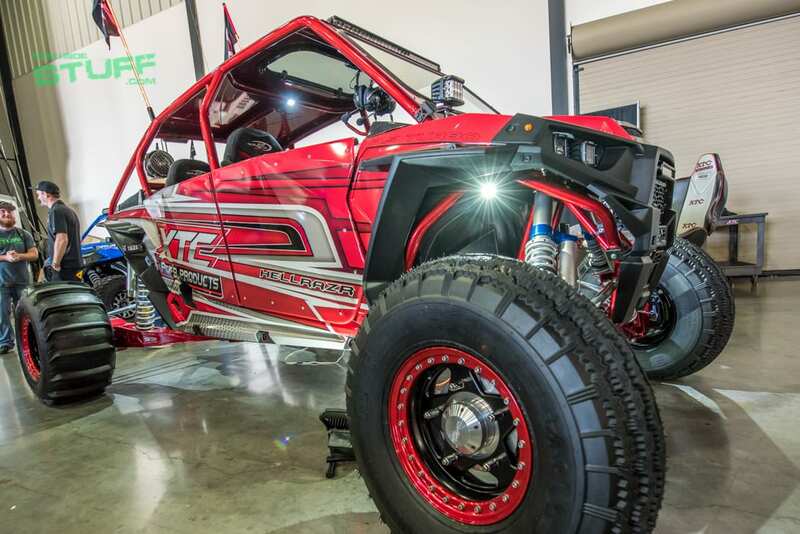 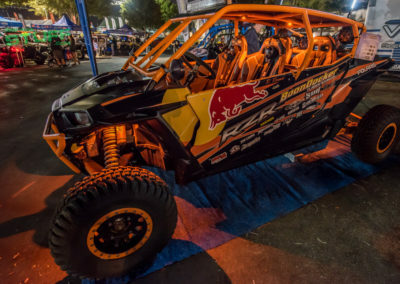 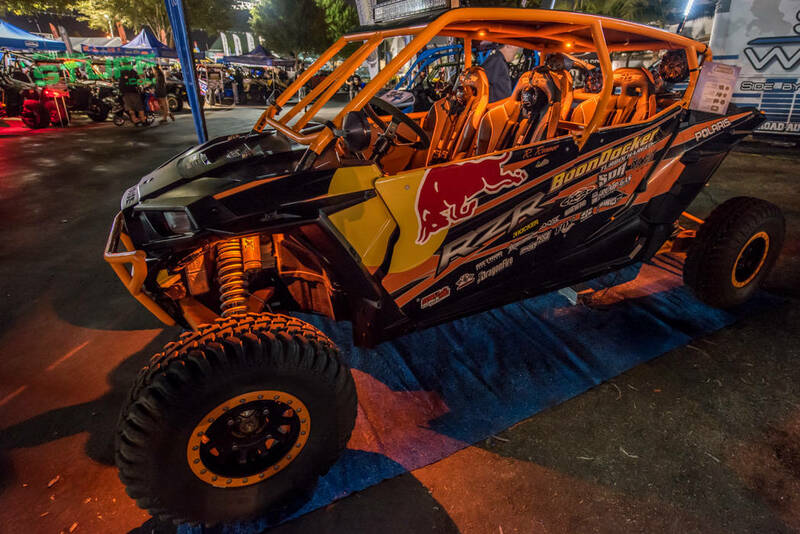 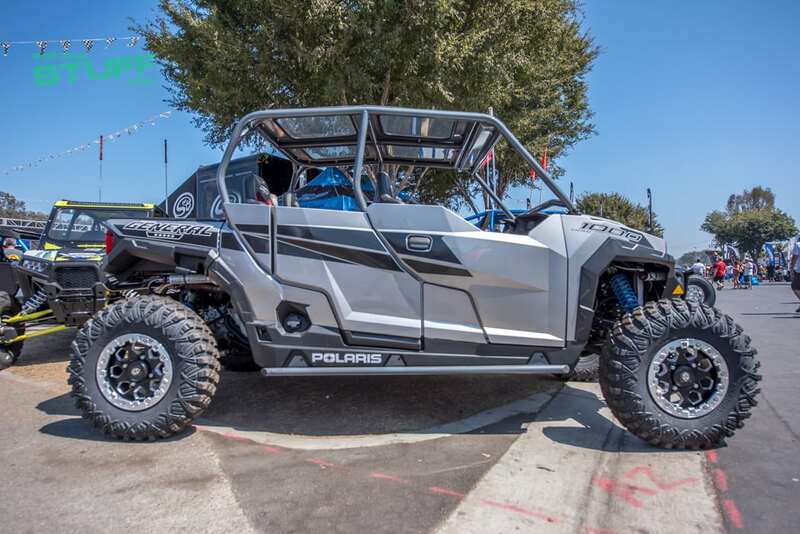 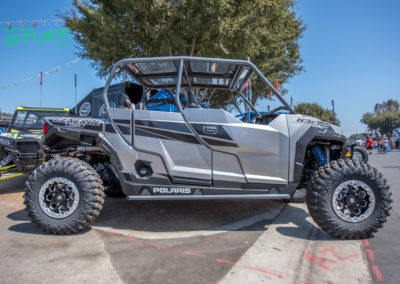 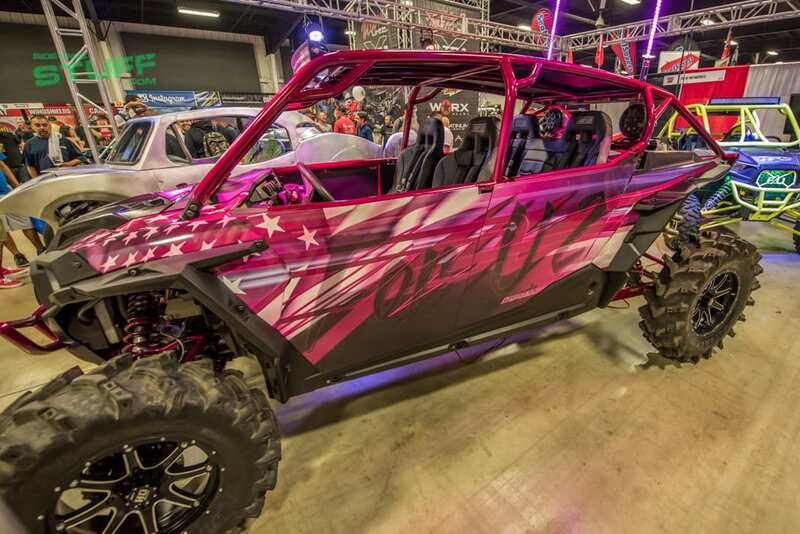 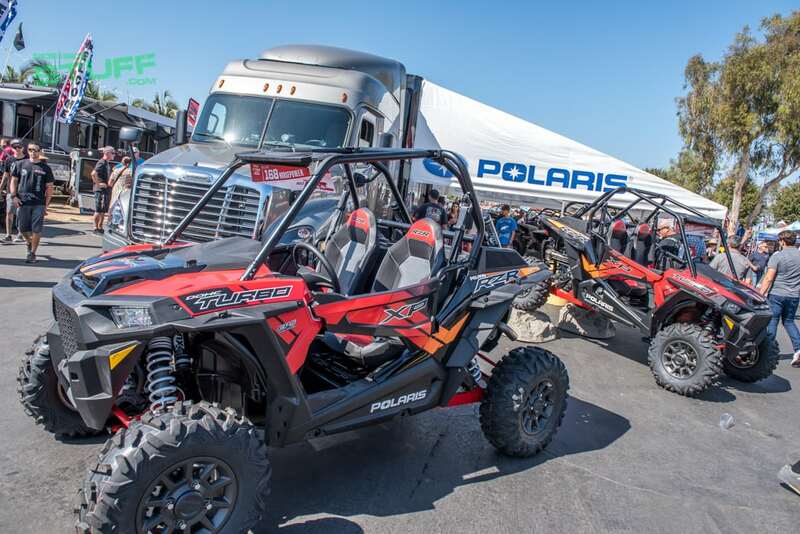 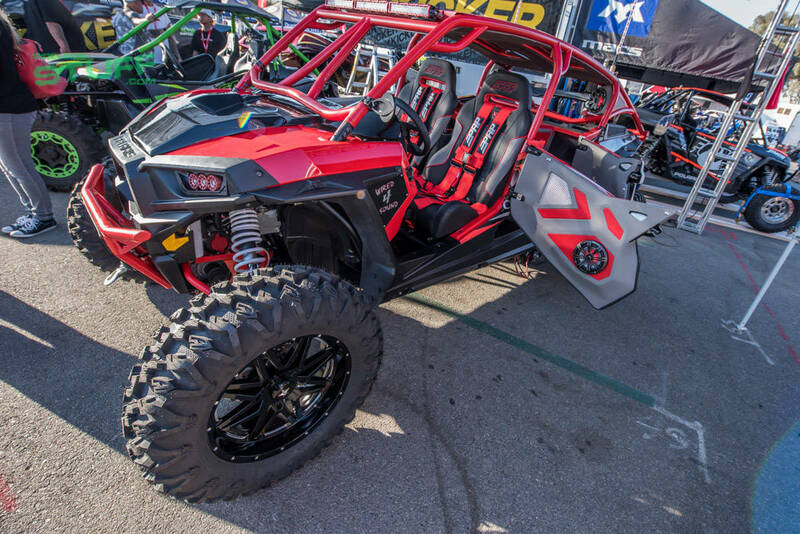 Polaris unveiled the anticipated 2017 RZR XP Turbo EPS, the new XP Turbo models feature a new ProStar Turbo H.O. 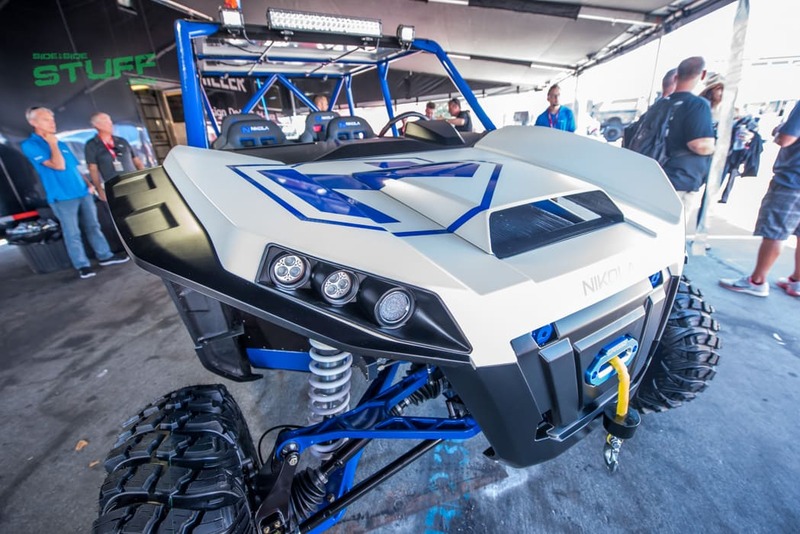 engine that unleashes a whopping 168 HP. 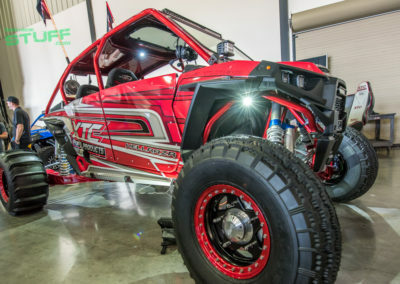 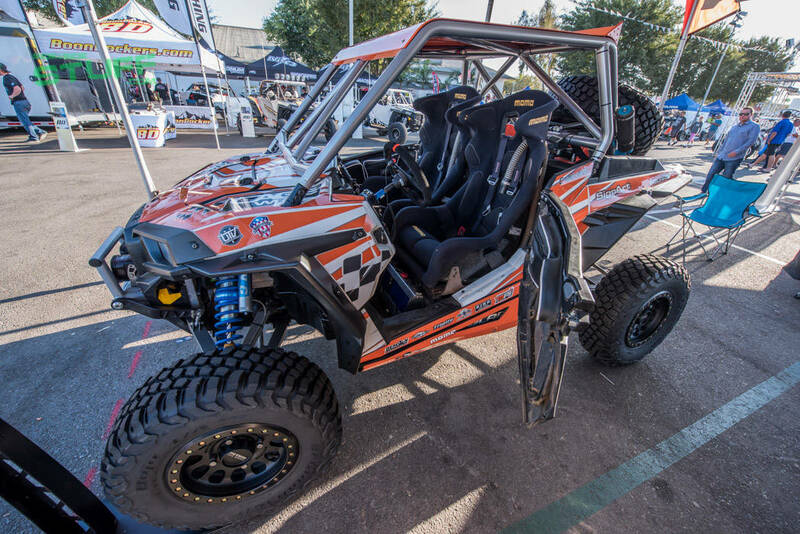 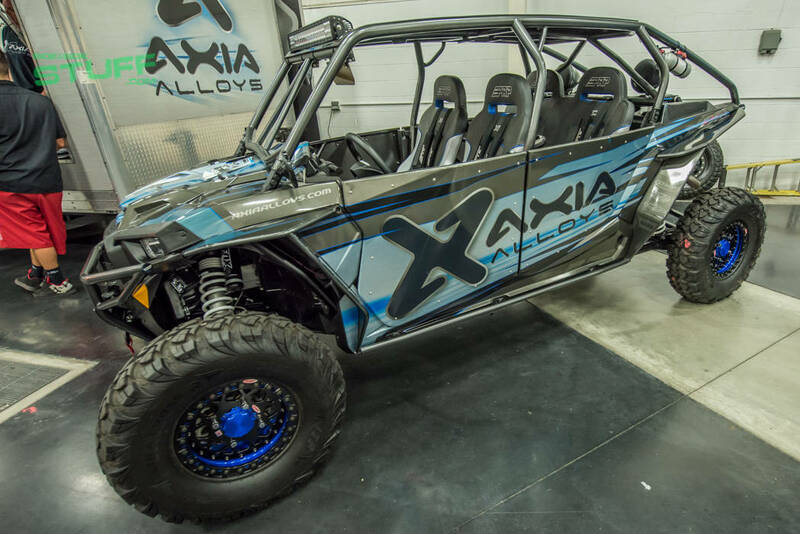 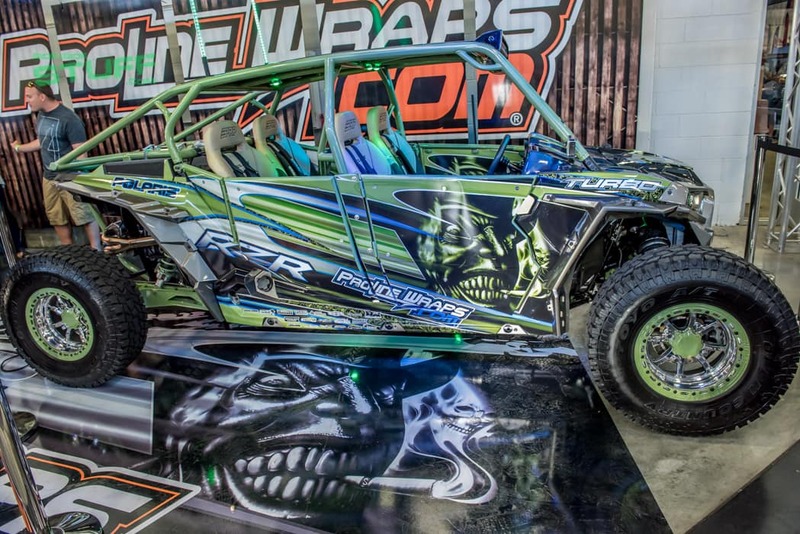 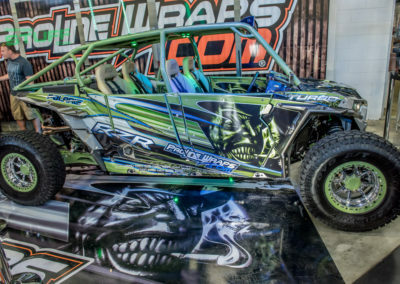 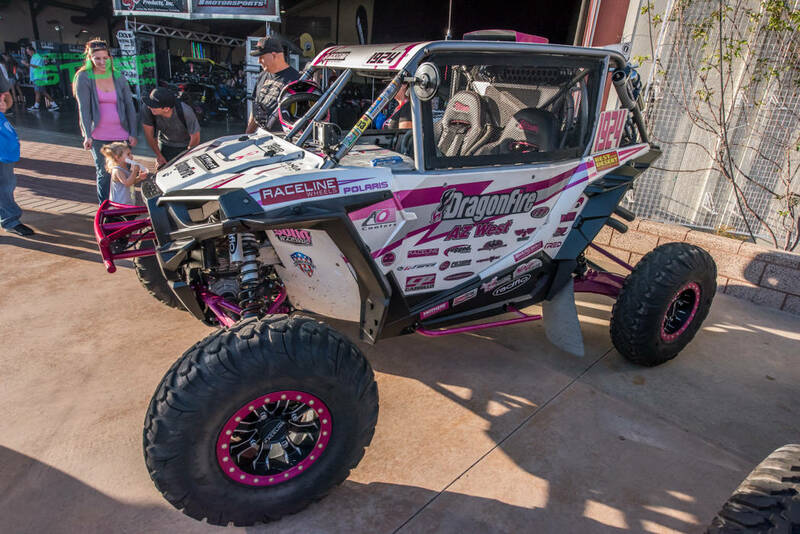 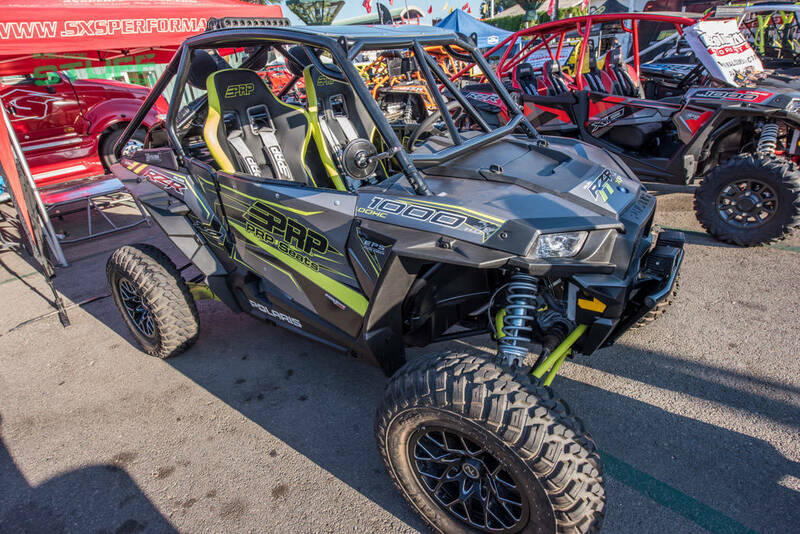 Pro UTV Racer RJ Anderson had his hands on one already, RJ was excited to finally get to show the 2017 XP Turbo they had been working on for the new XP1K4 film premiering at Camp RZR in October. 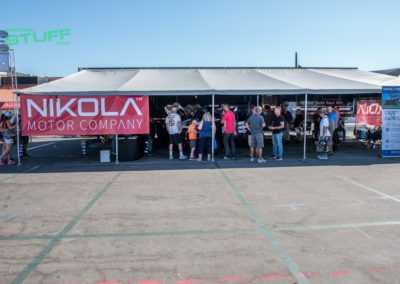 Another interesting side by side debut was the Nickola Zero, an all-electric SxS that features instant torque; a 400 Volt electric drivetrain delivers up to 130 HP per wheel resulting in up to 520 HP. 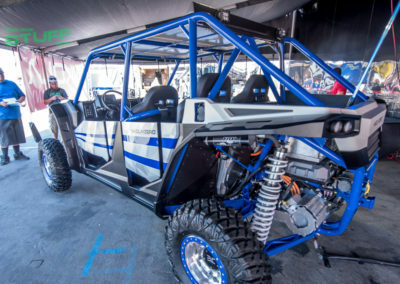 The electric UTV also has some really nice ergonomic features. 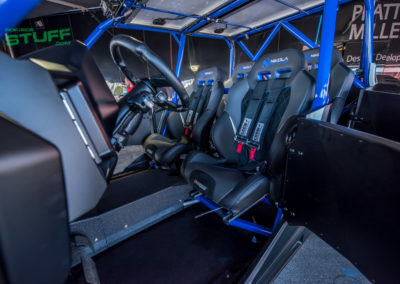 This was only the first concept machine; the guys at Nikola said they’ve already started working on the second concept machine and plan to go to market in the near future. 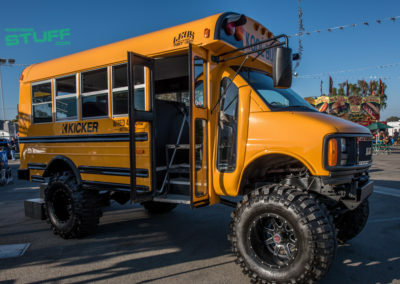 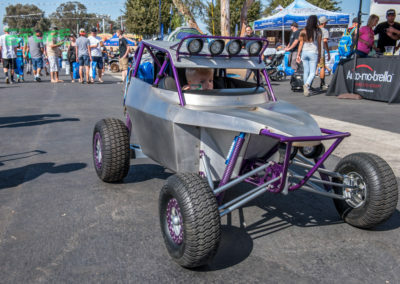 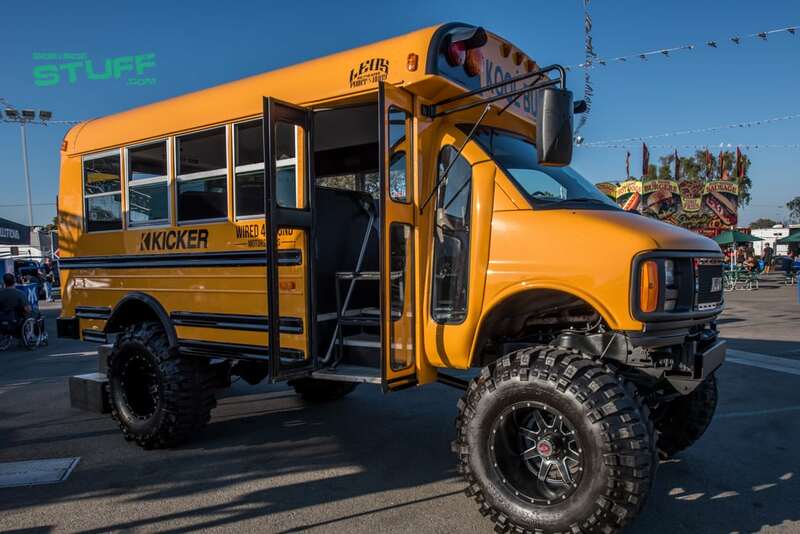 Aside from awesome custom UTV builds, trucks and sand rails, there was a handful of interesting unique vehicles on display. 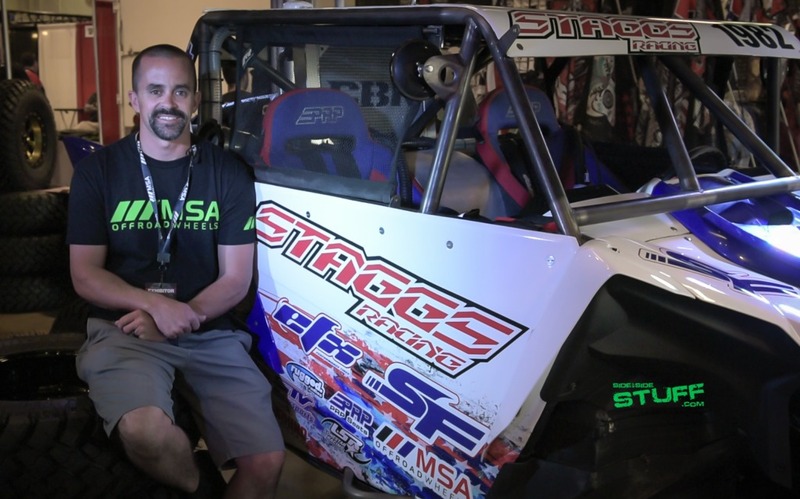 Many other Pro UTV racers made appearances at the show throughout the weekend including Adrian Orellana at the Assault Industries booth and Jeremiah Staggs at the MSA Wheels / EFX Tires booth, Staggs was kind enough to sit down with us for a brief interview that will be released in the near future. 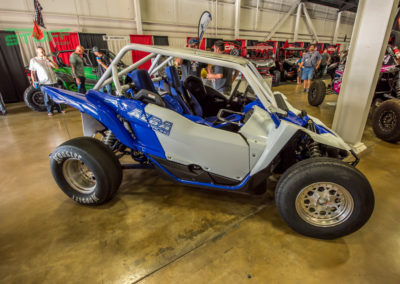 Aside from the abundance of vendors and machines, there was much more entertainment at the show as attendees would enjoy races held throughout the weekend. 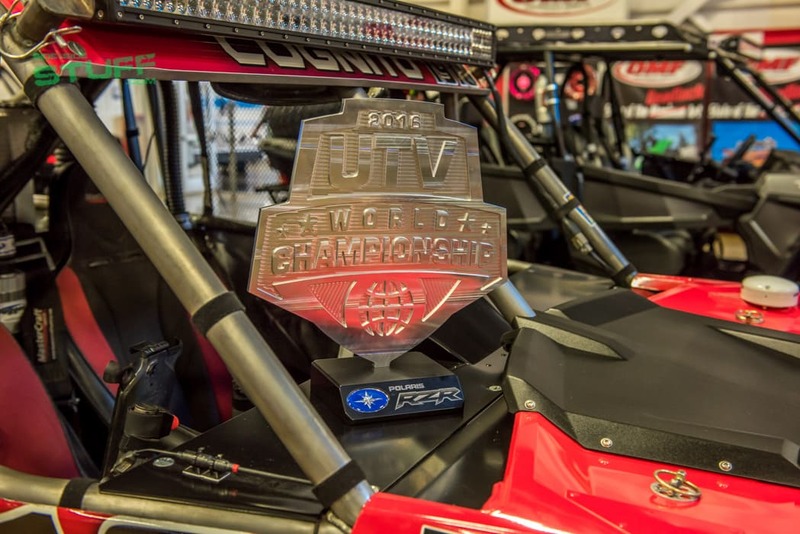 Races included Stadium Super Trucks, Class 1400 Trucks, the Open UTV Shootout and Arctic Cat Side X Side Races. 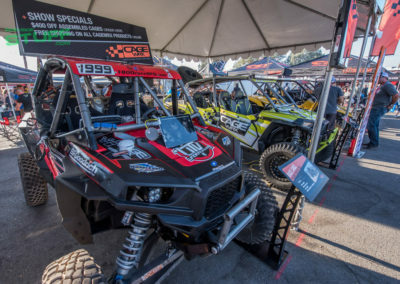 The UTV racing events were held on a combined asphalt and dirt course and included several competitors from the WORCS Off Road Series. 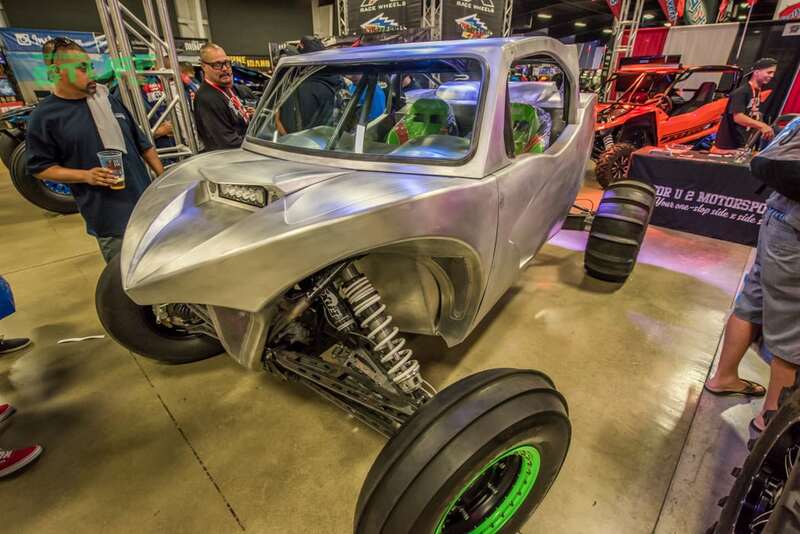 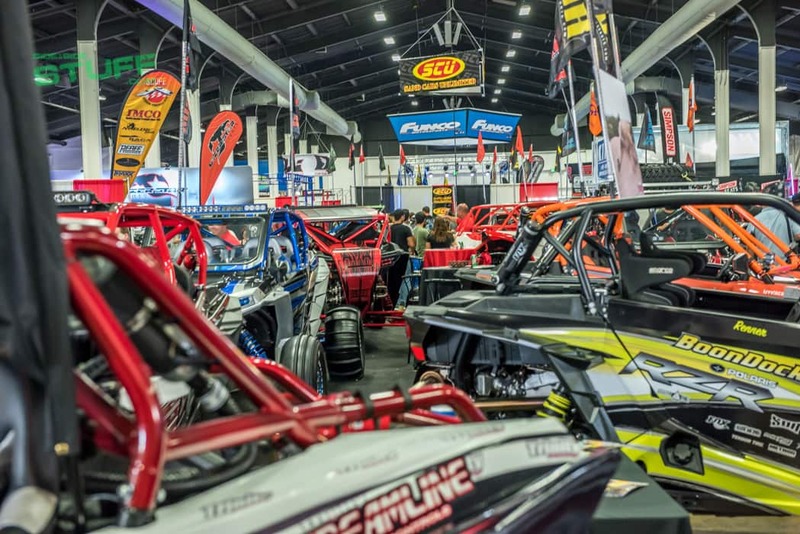 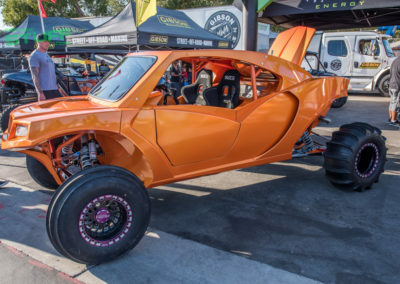 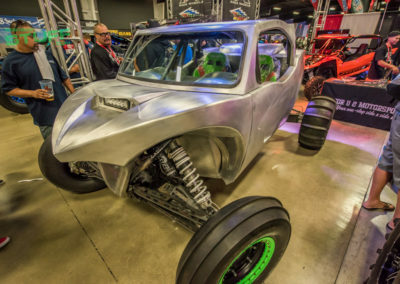 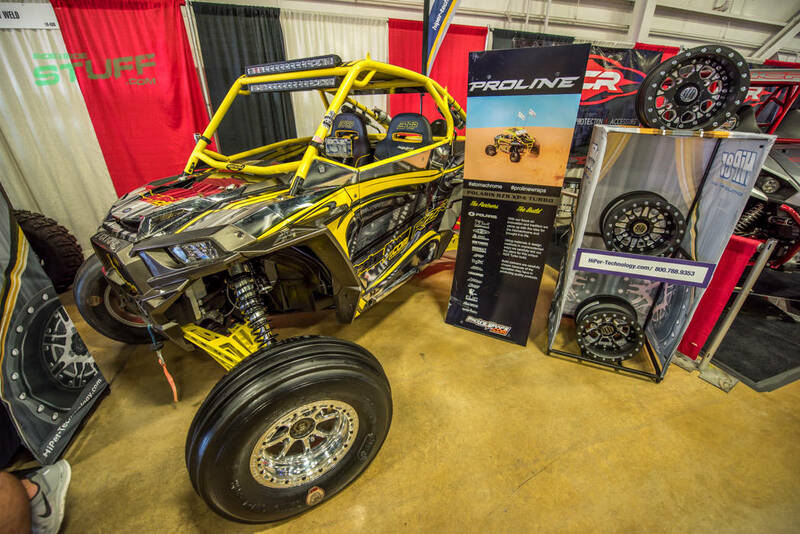 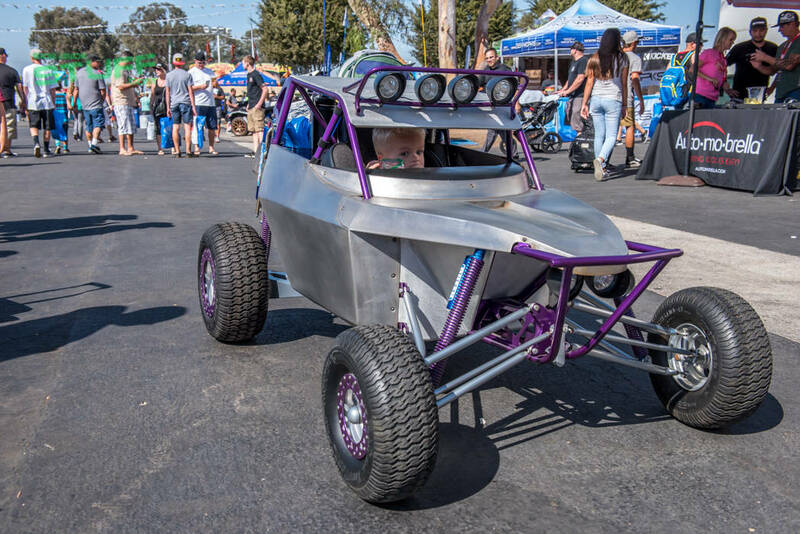 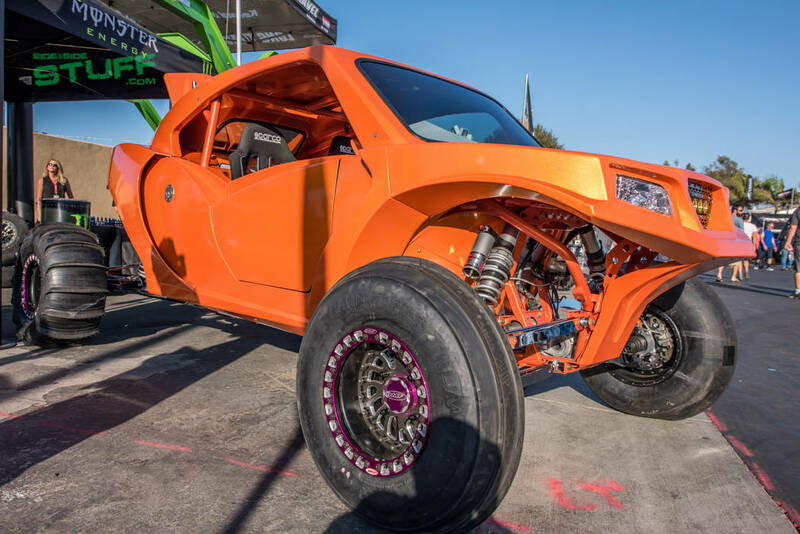 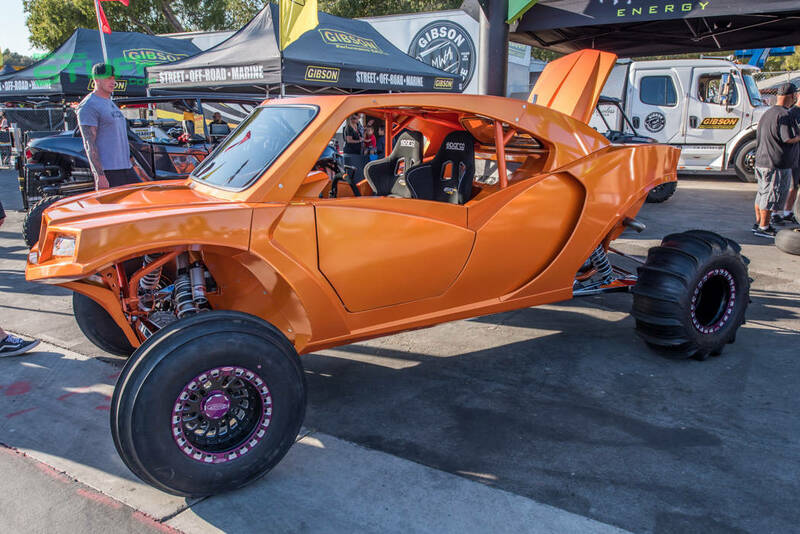 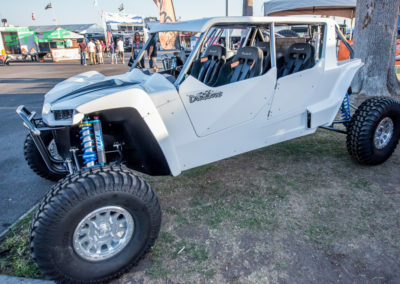 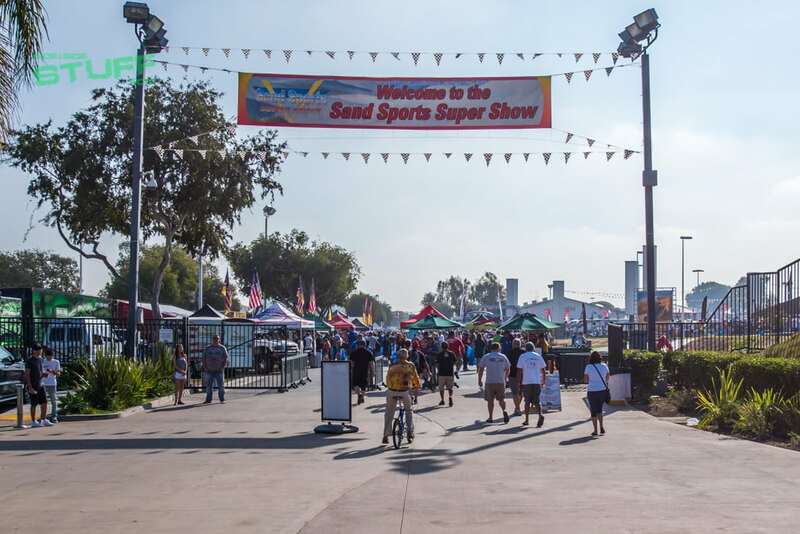 All in all, the 2016 Sand Sports Super Show was a blast. 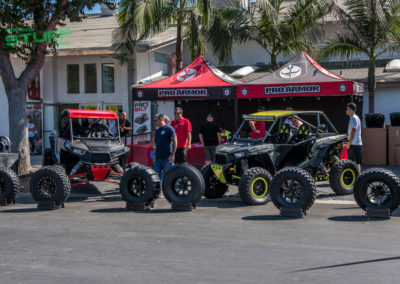 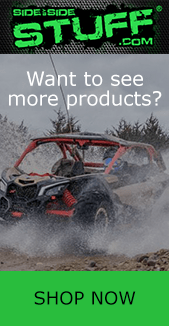 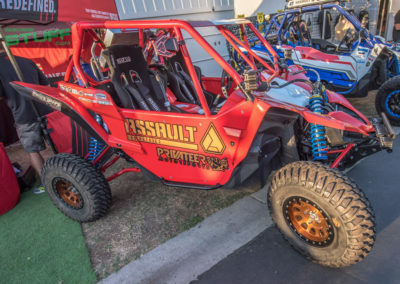 We caught up with tons of our vendors at the show, took a look at some great new products and even scouted for new vendors and products to add to our extensive selection of UTV parts and accessories at SideBySideStuff.com. Yes it’s hard work, but we had fun. 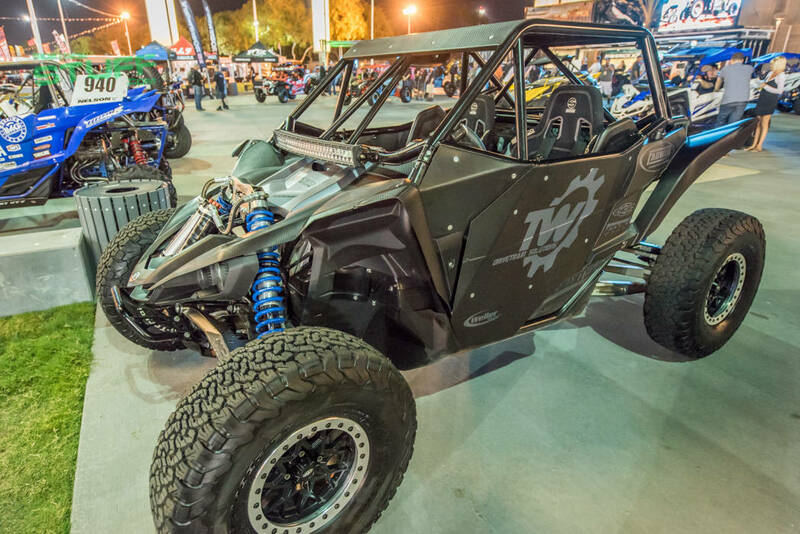 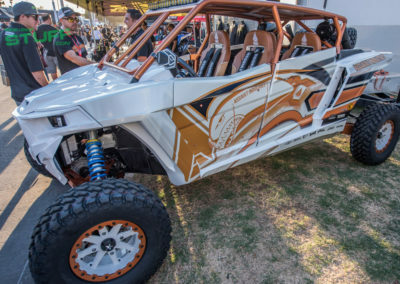 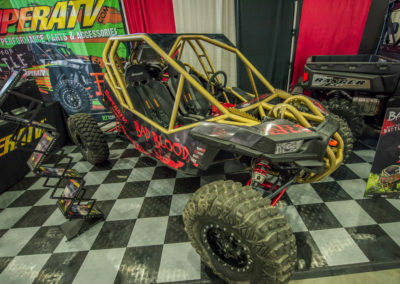 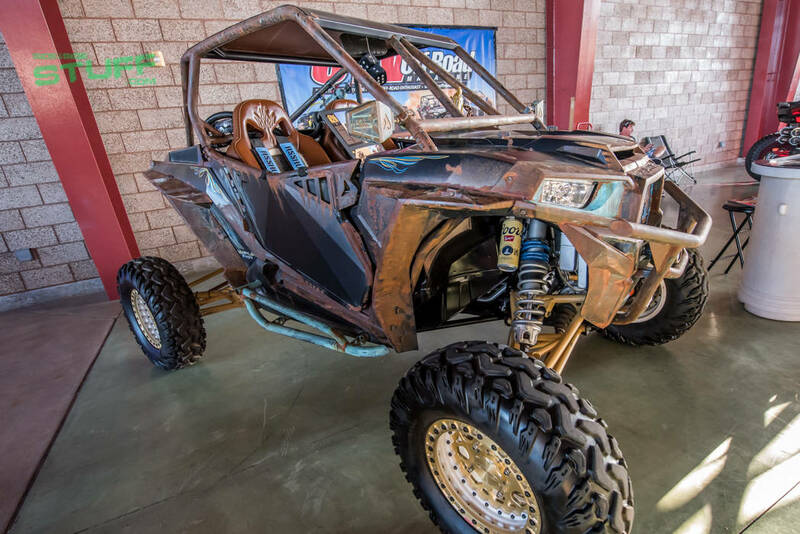 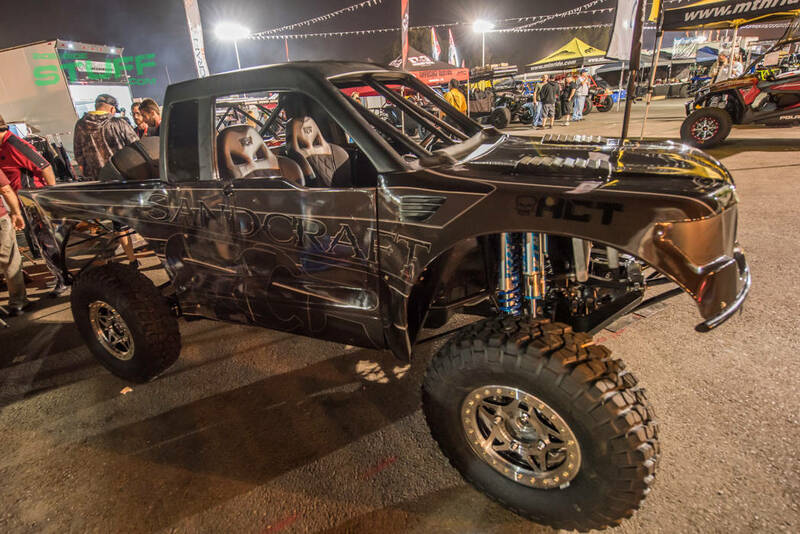 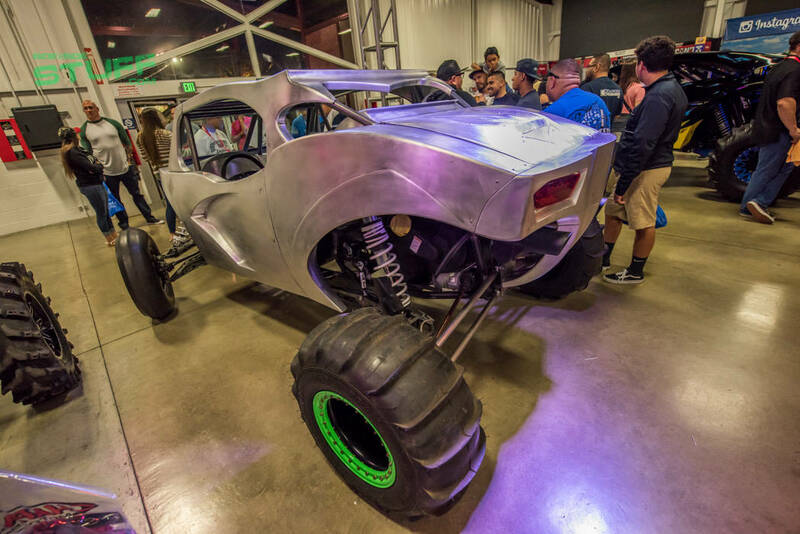 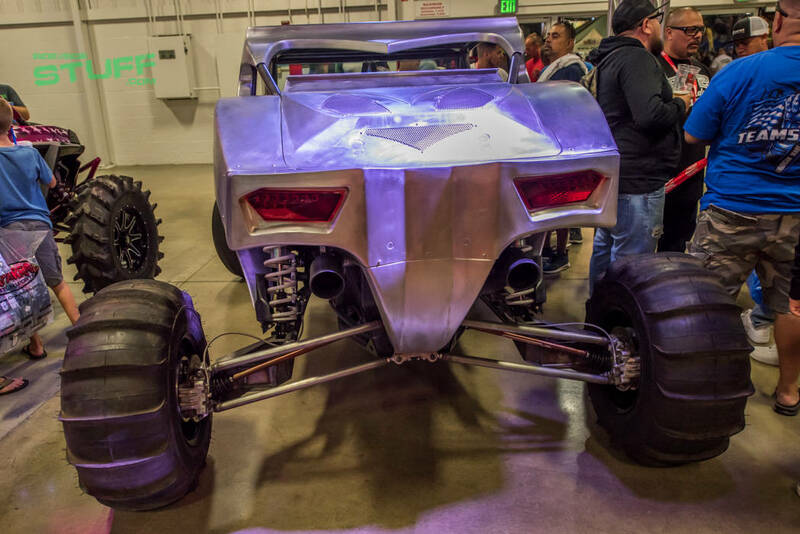 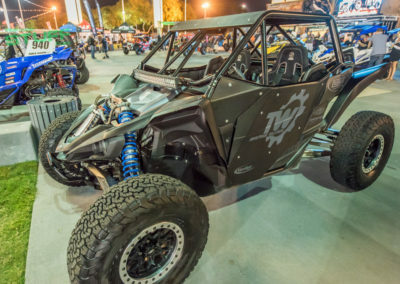 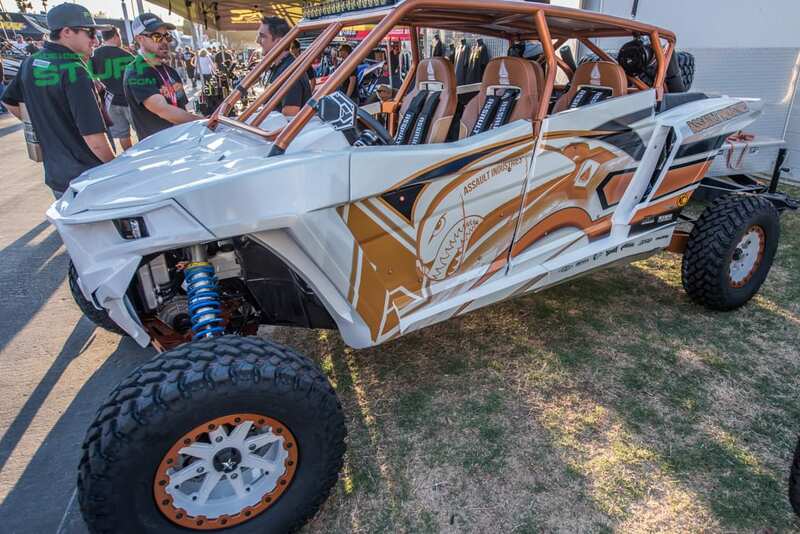 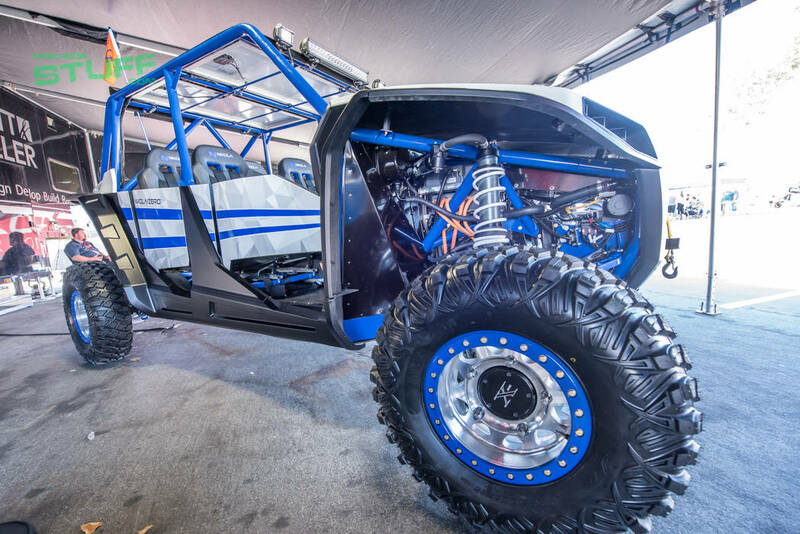 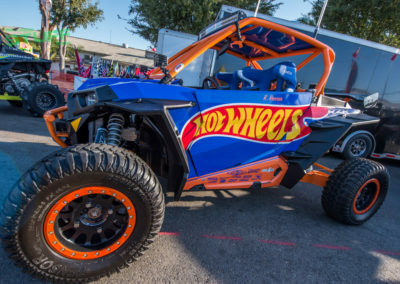 If you’re interested in the latest in side by side technology or would just love to check out some of the sweetest custom off-road builds in the industry, we invite you to join us at the 2017 Sand Sports Super Show next year; we guarantee you’ll want to make this an annual event to attend for years to come.